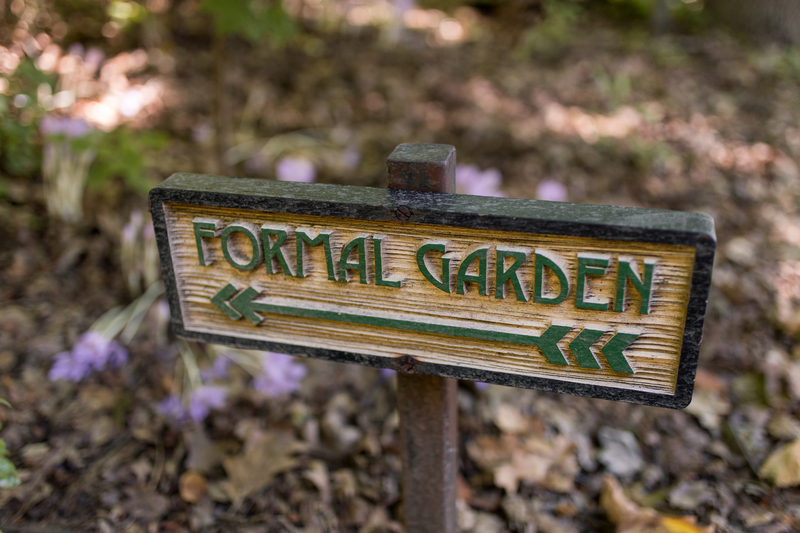 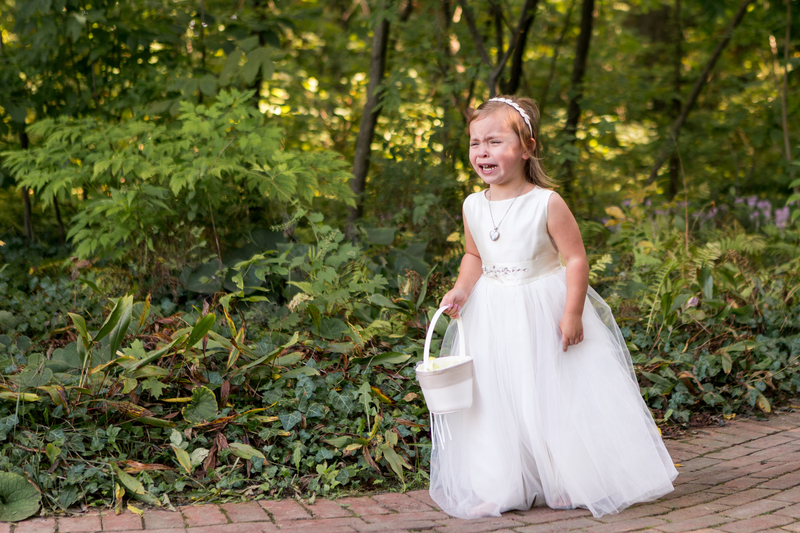 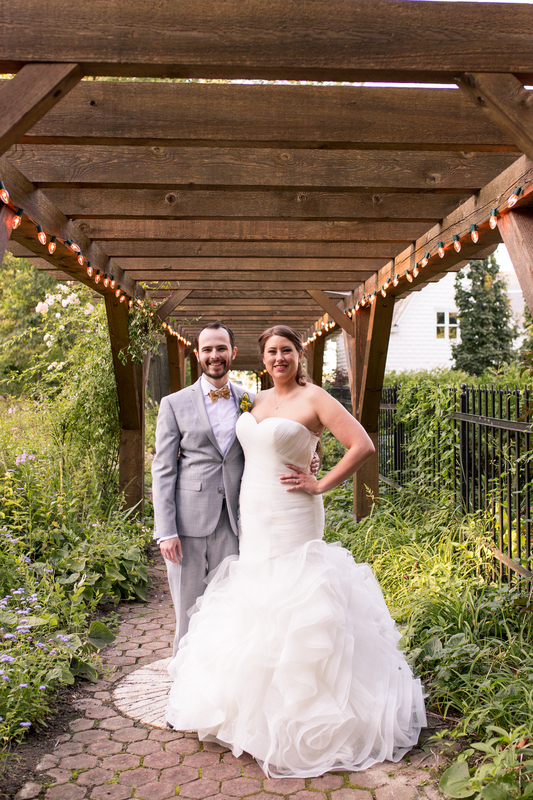 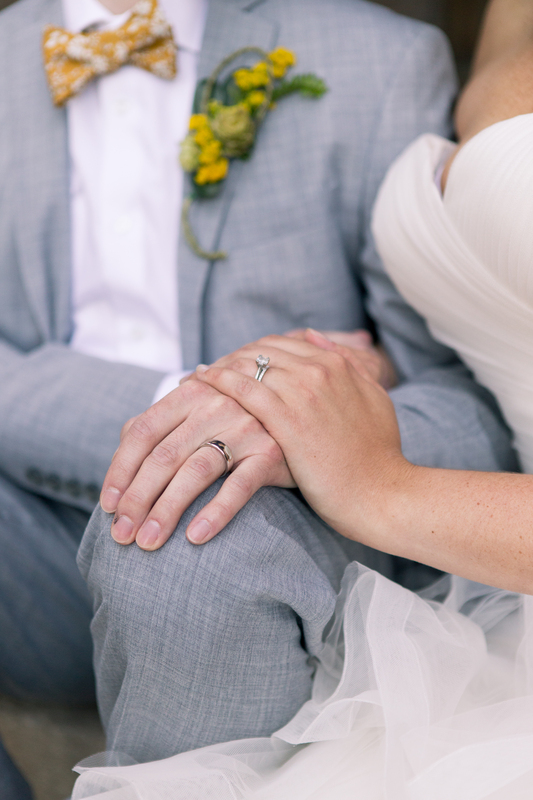 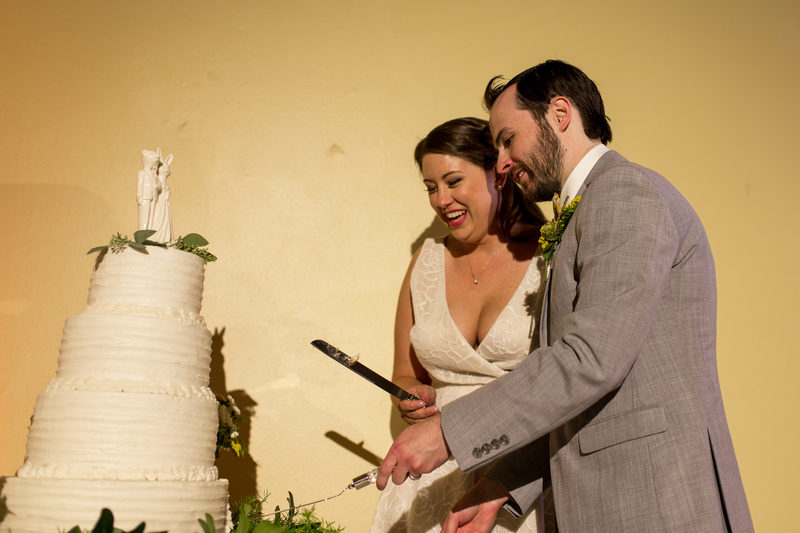 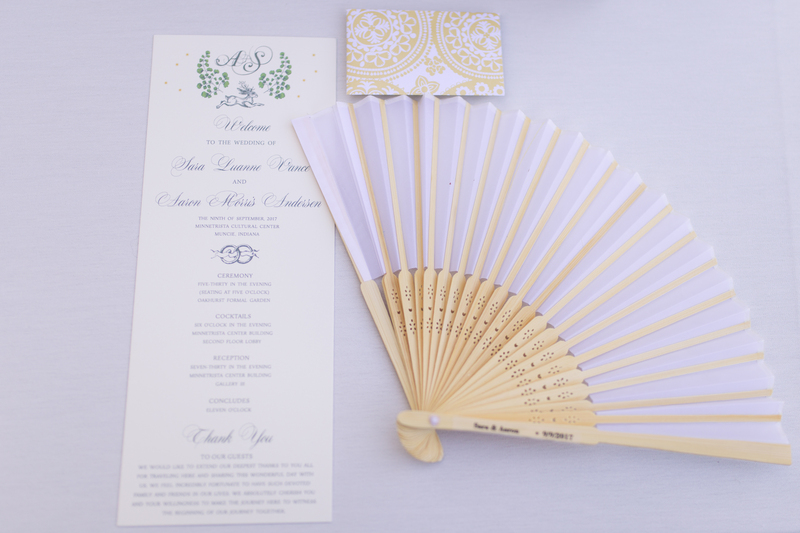 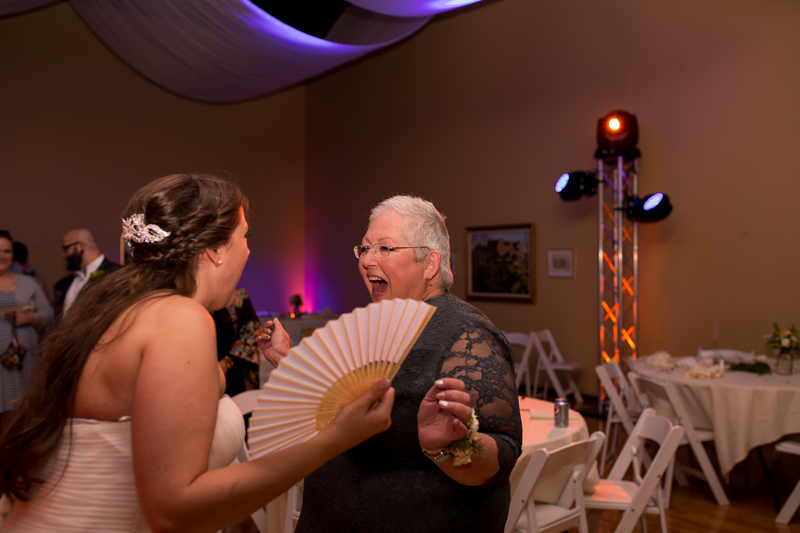 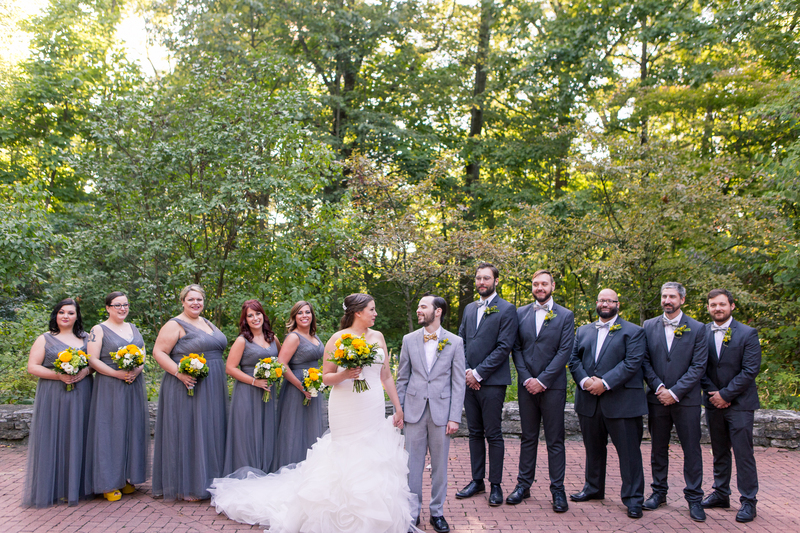 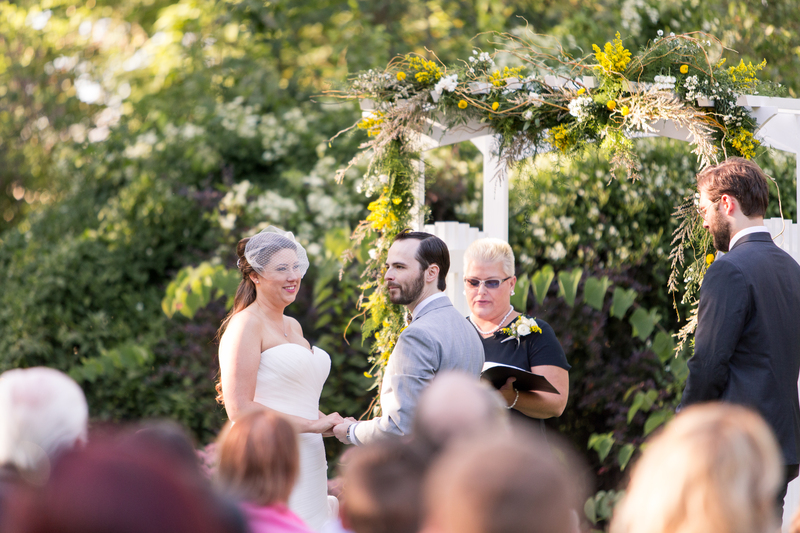 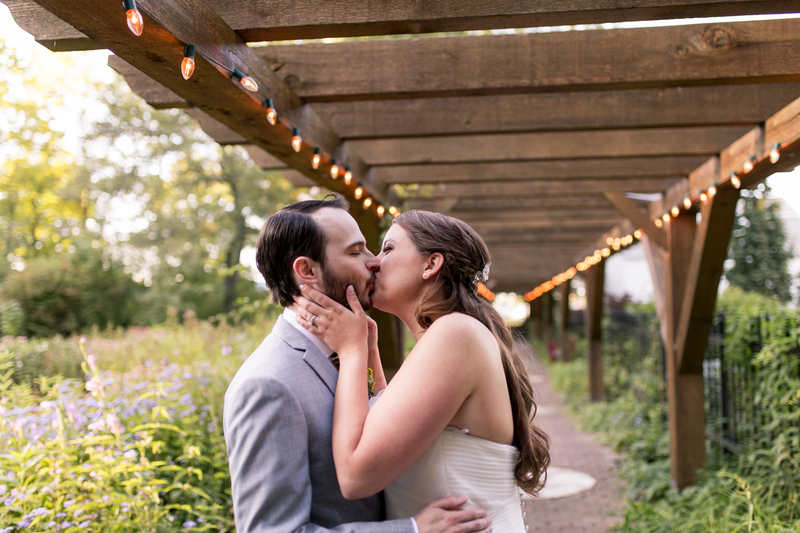 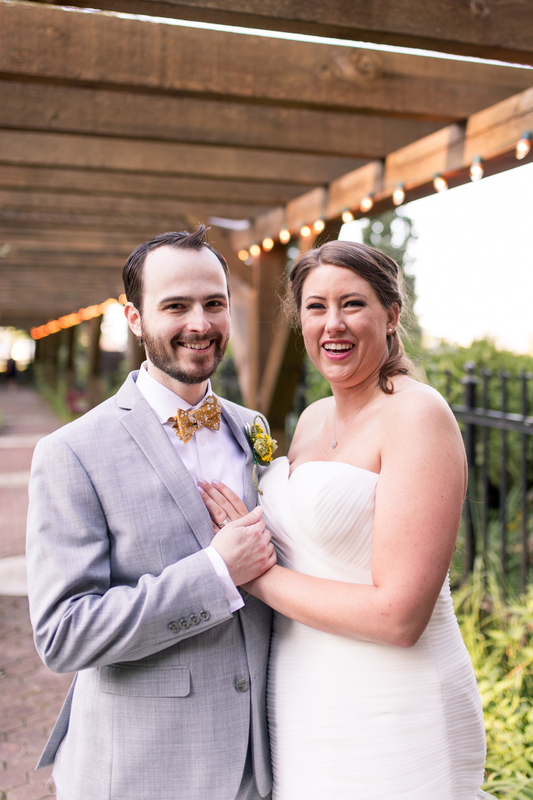 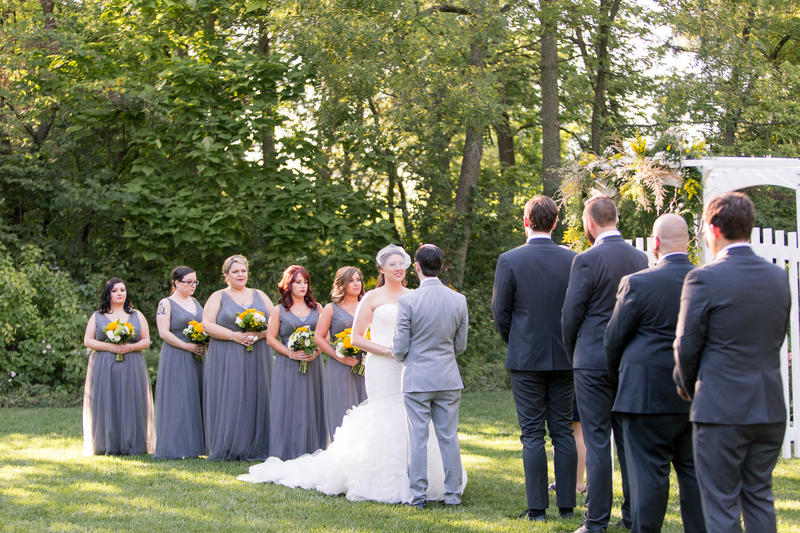 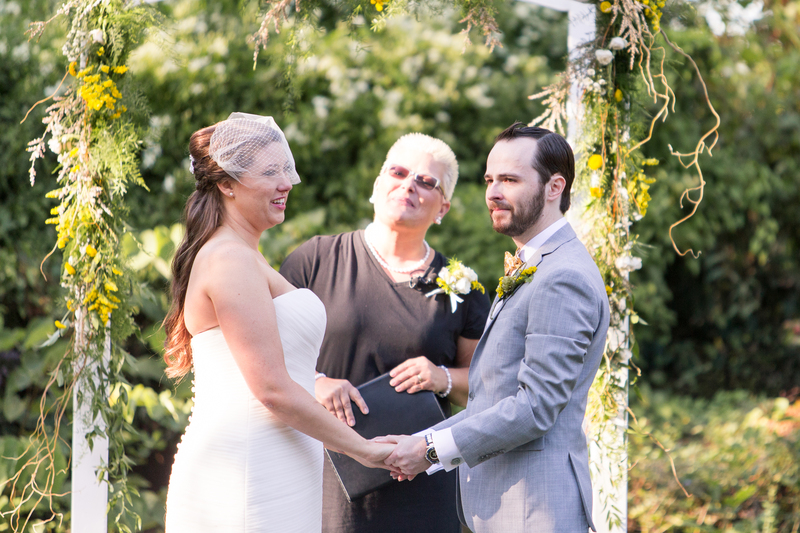 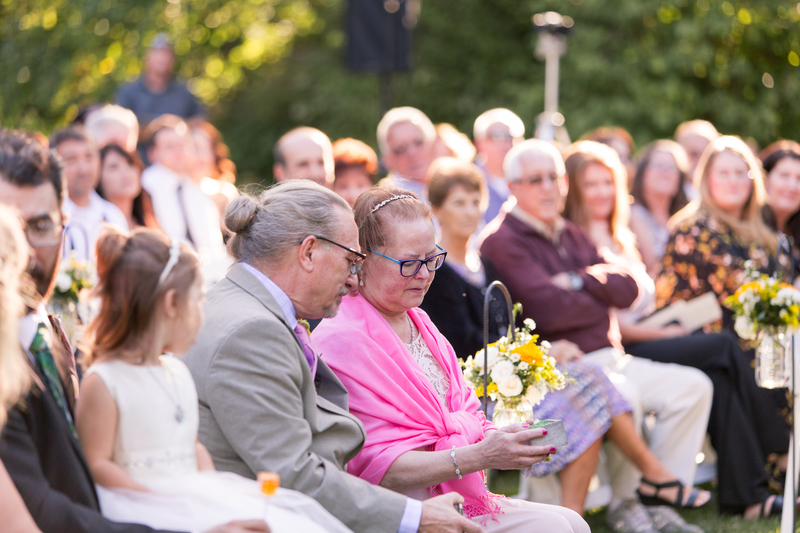 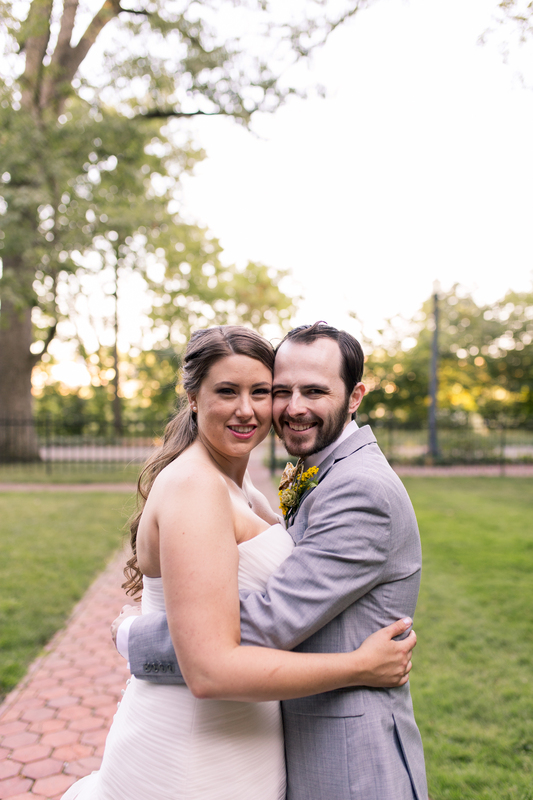 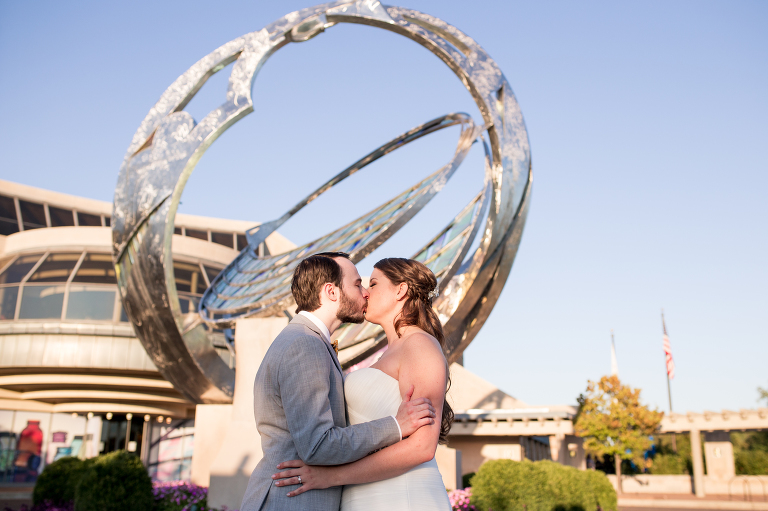 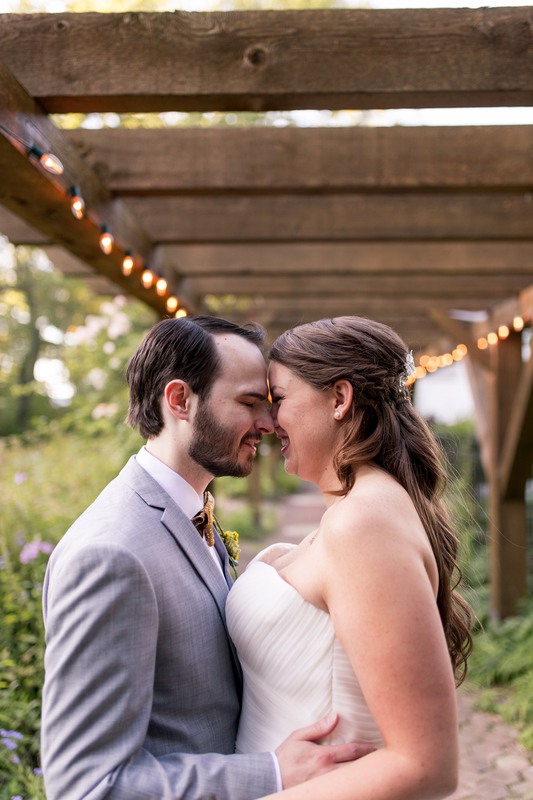 Sara & Aaron’s Minnetrista Oakhurst Garden wedding in Muncie, Indiana was truly one of a kind. 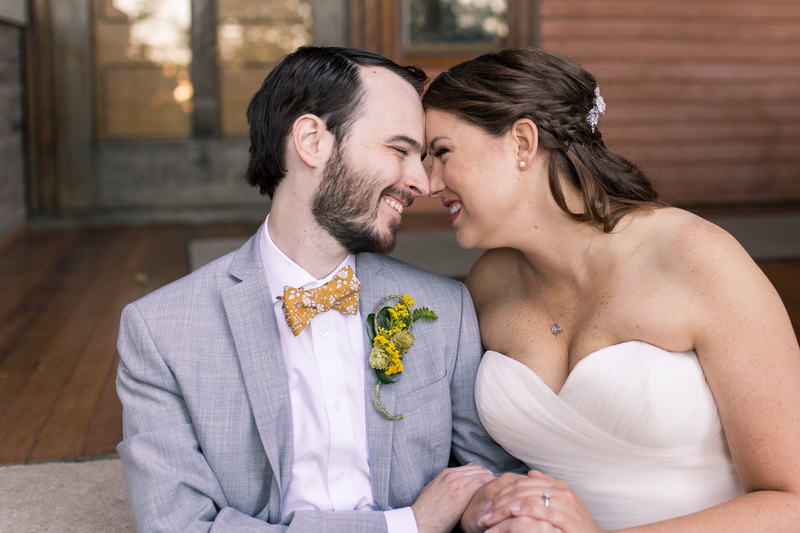 Though they are currently living in Portland, Oregon, they wanted to return to the town where they first fell in love to tie the knot. 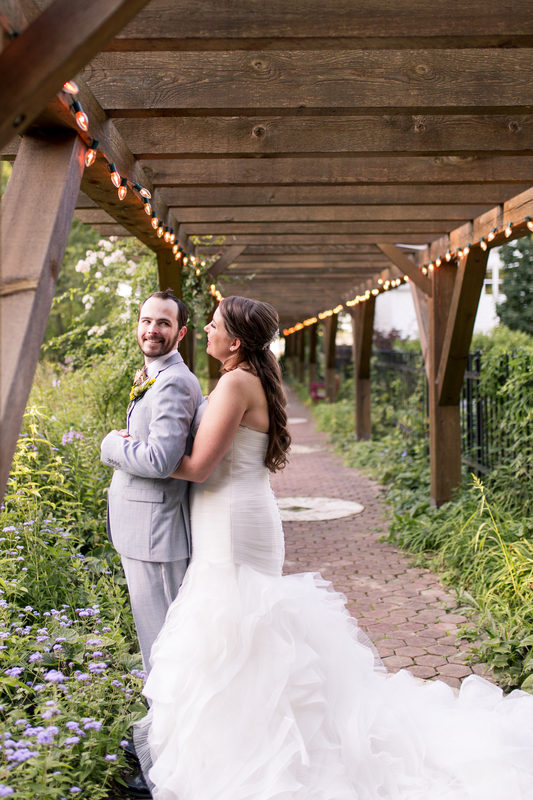 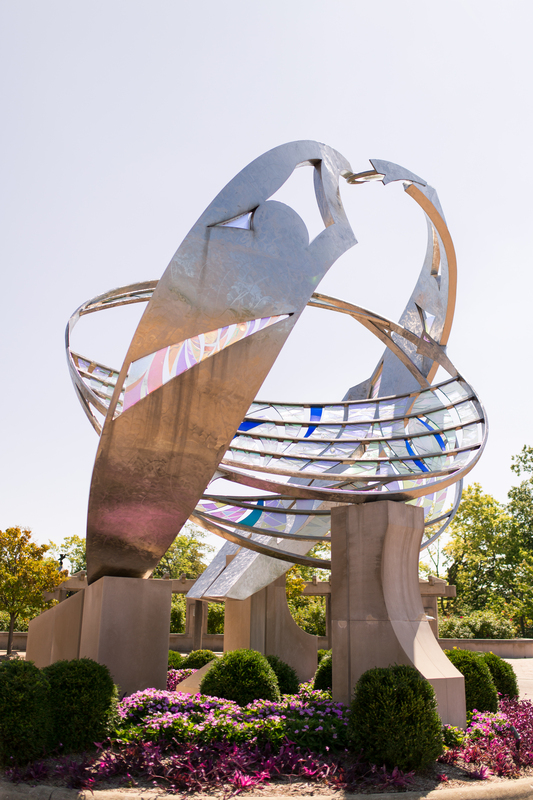 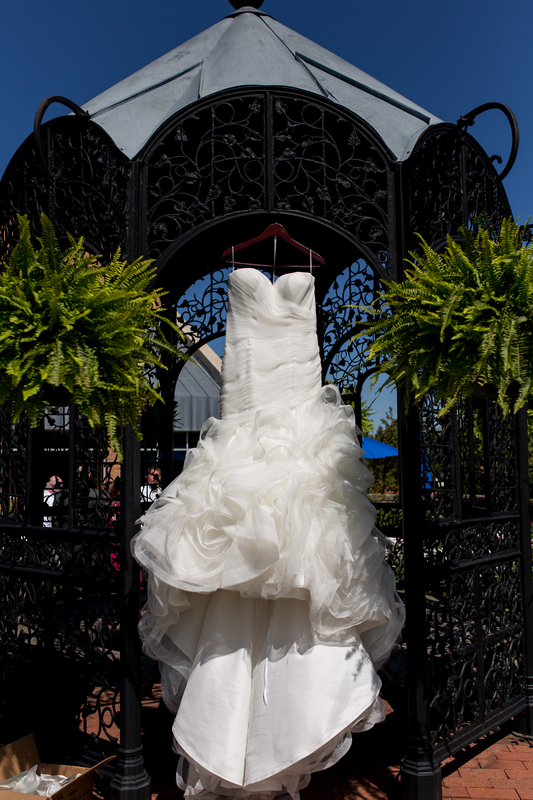 They chose Minnetrista for their venue, with its rich Muncie history and famous Ball jars. 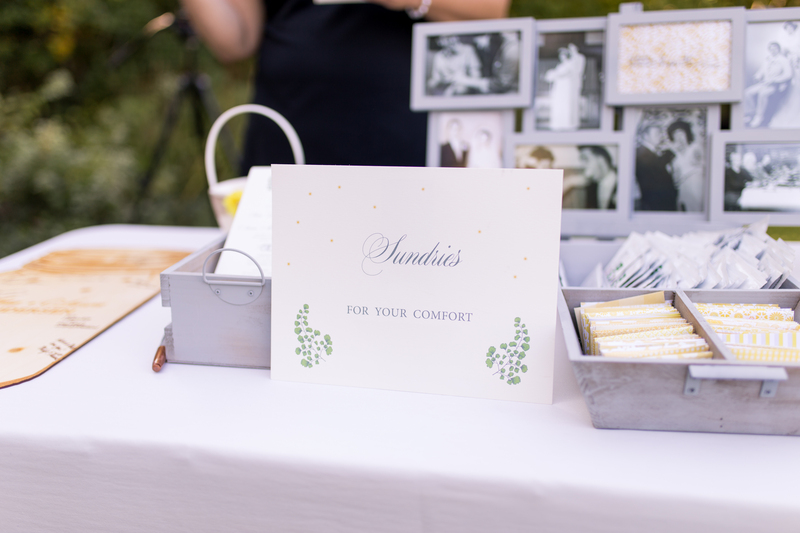 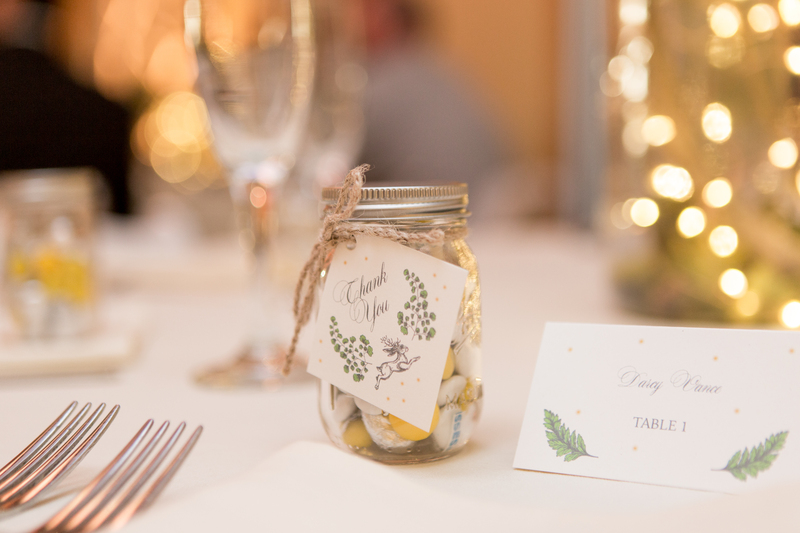 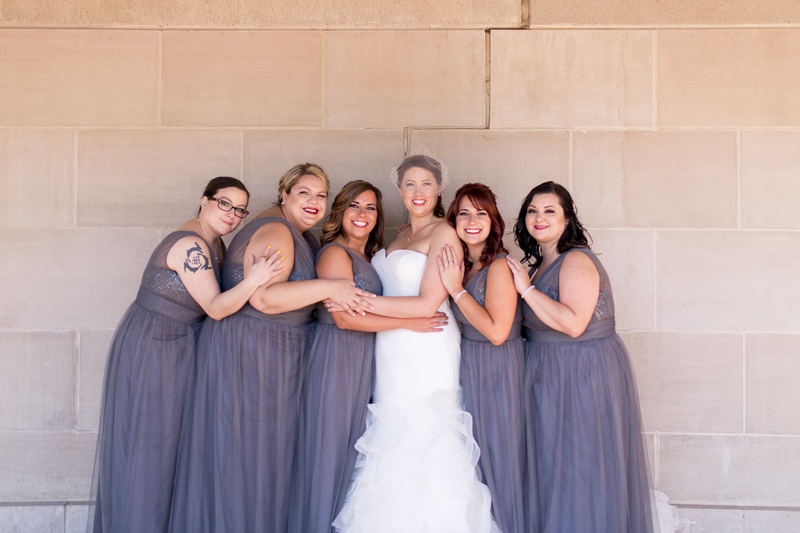 Their day was filled with small, lovely details, including beautiful Ball jar floral arrangements and touches of Star Wars within their bridal party. 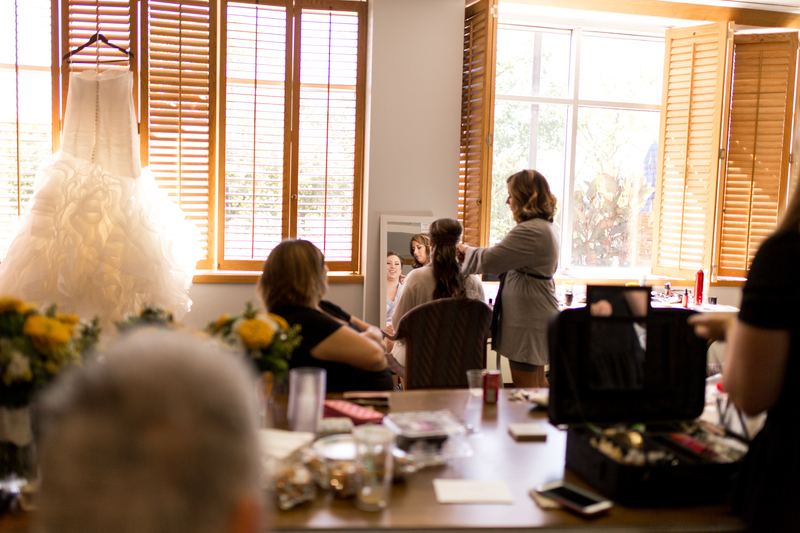 I loved getting to hang out with the gals in the afternoon while they prepared for the day. 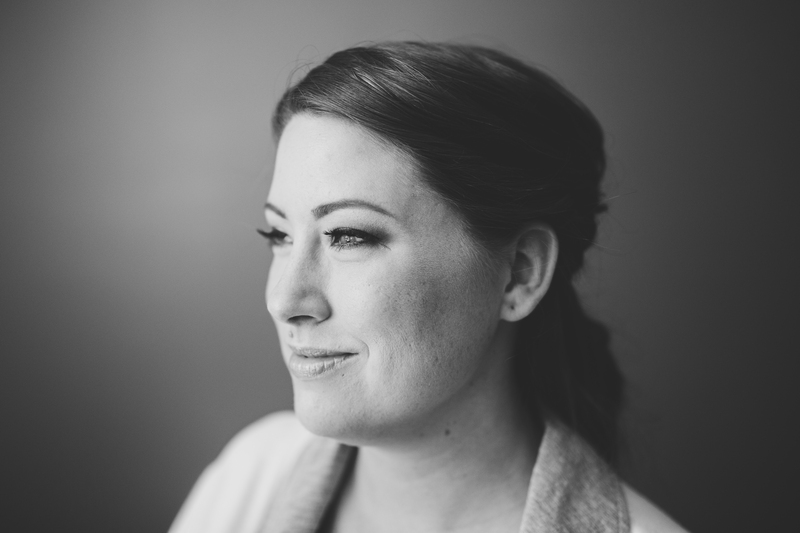 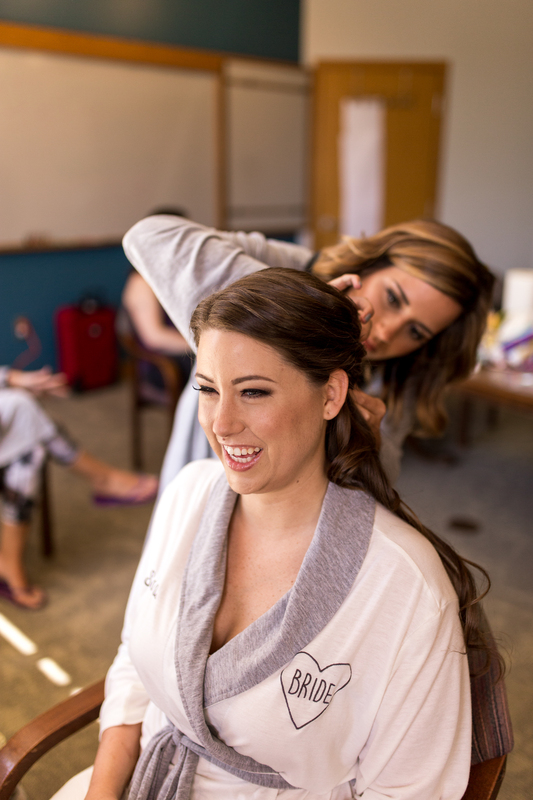 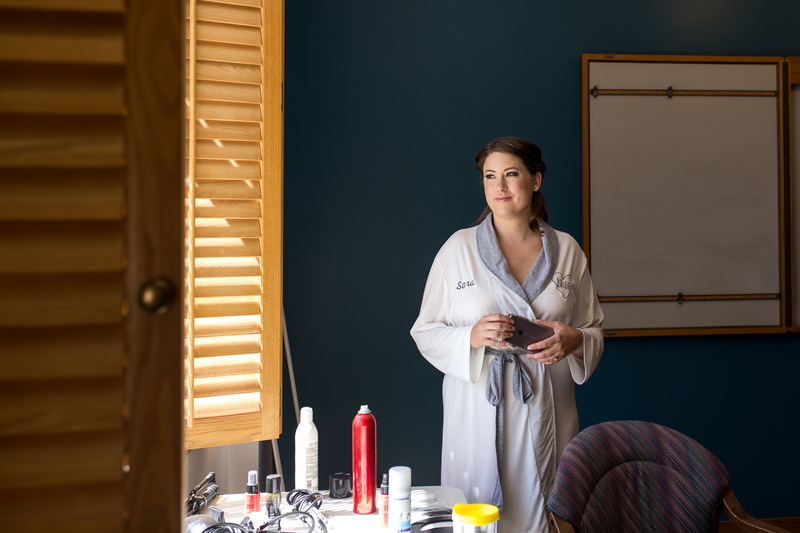 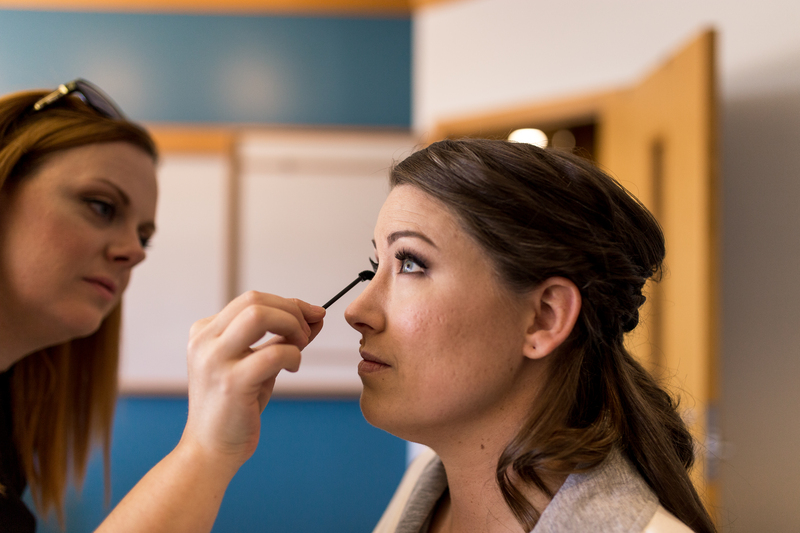 While Sara is a naturally joyful woman, she was absolutely radiant as she soaked up every moment of the afternoon’s preparation. 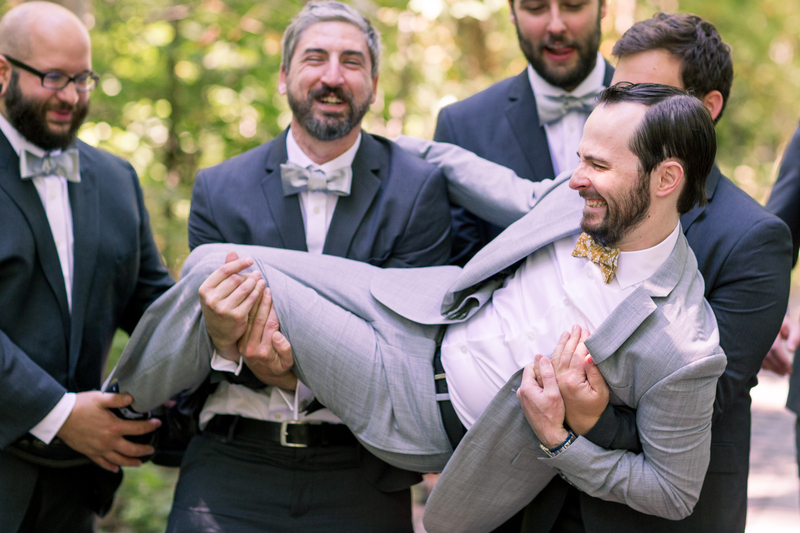 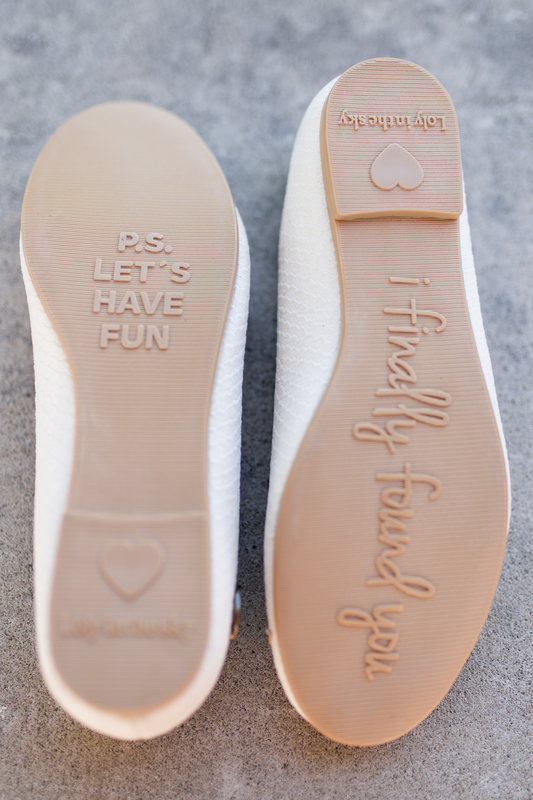 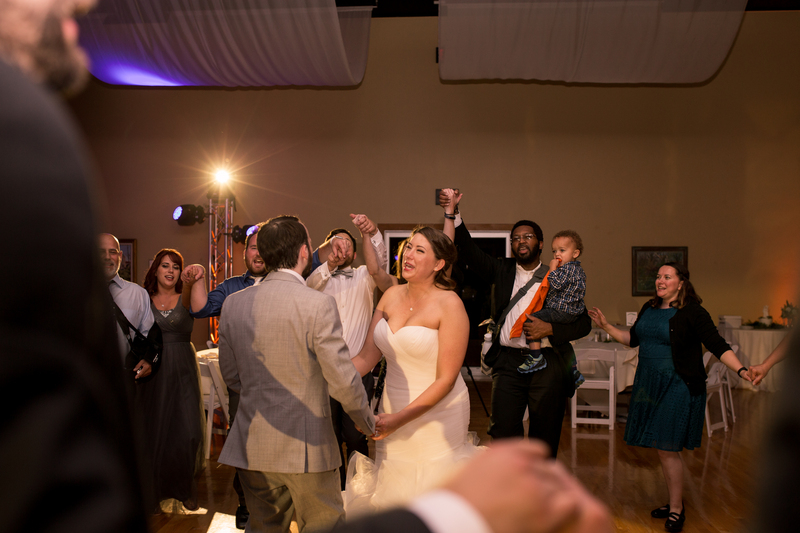 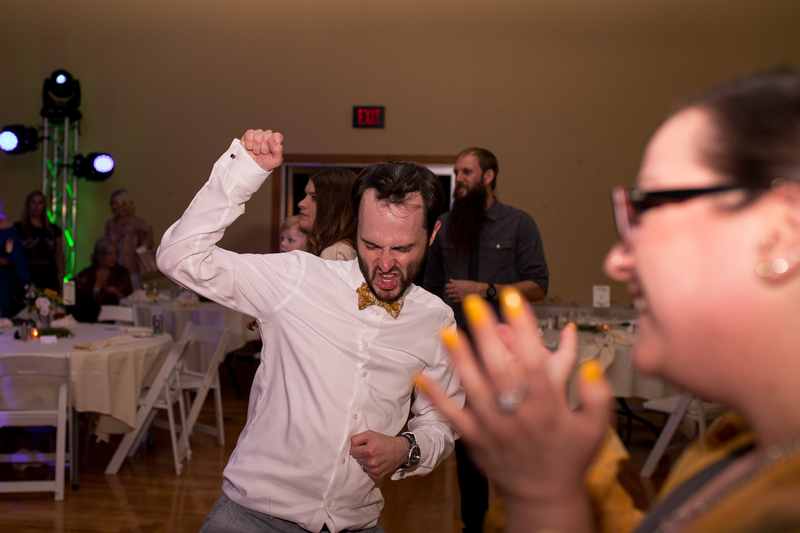 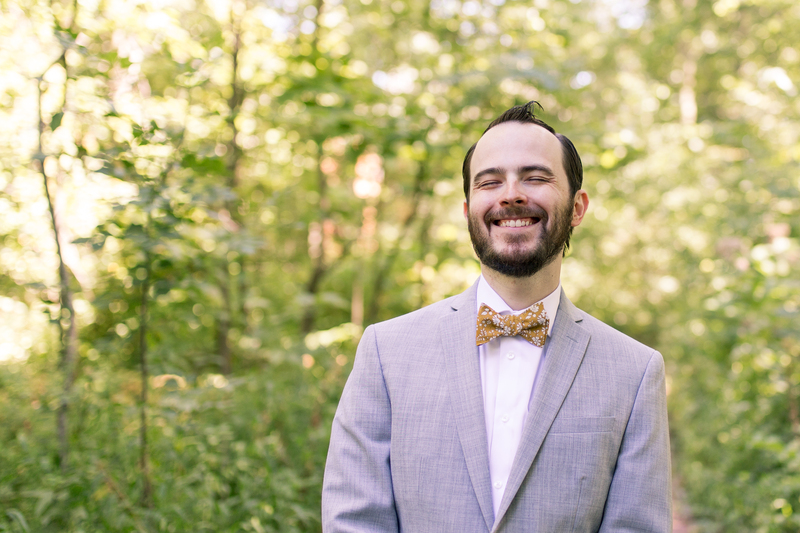 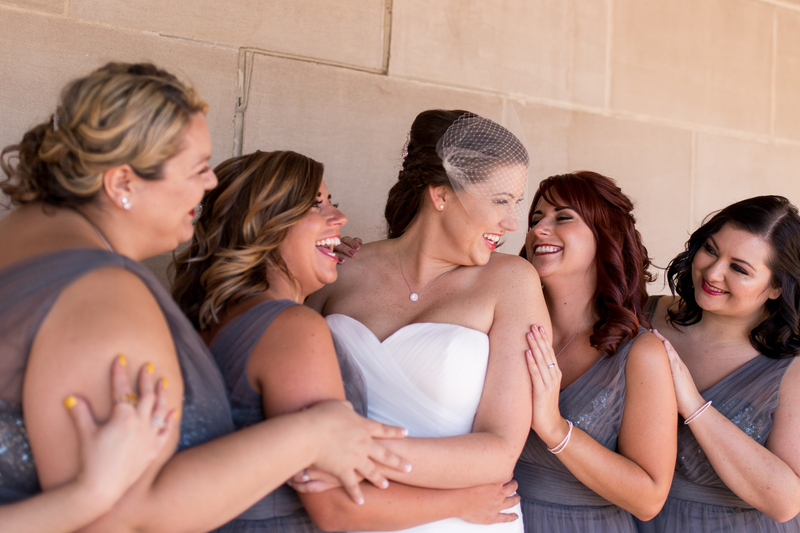 As we headed over to the cabin to meet Aaron and his groomsmen, we were met with laughter bursting from the building. 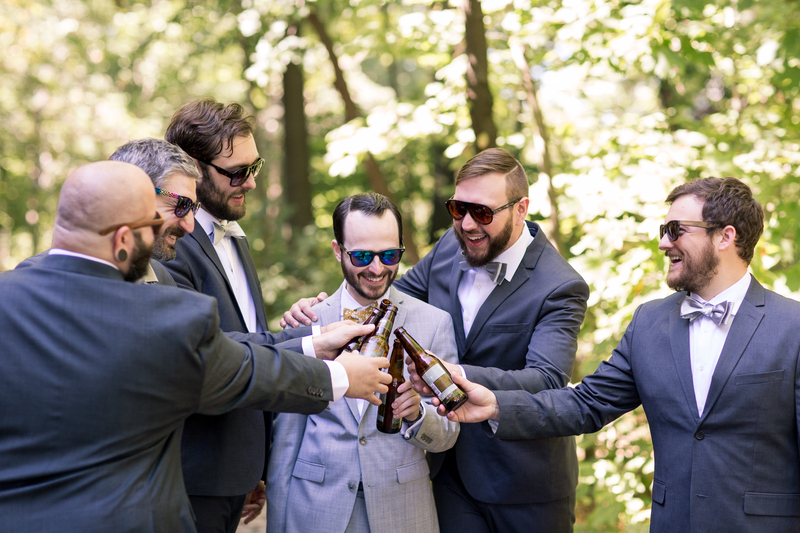 The gentlemen were having such a good time kicking back and enjoying themselves before the ceremony. 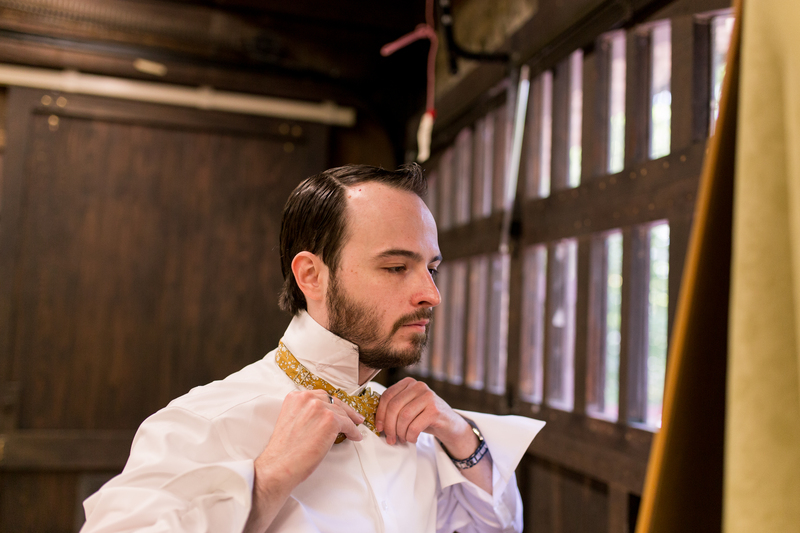 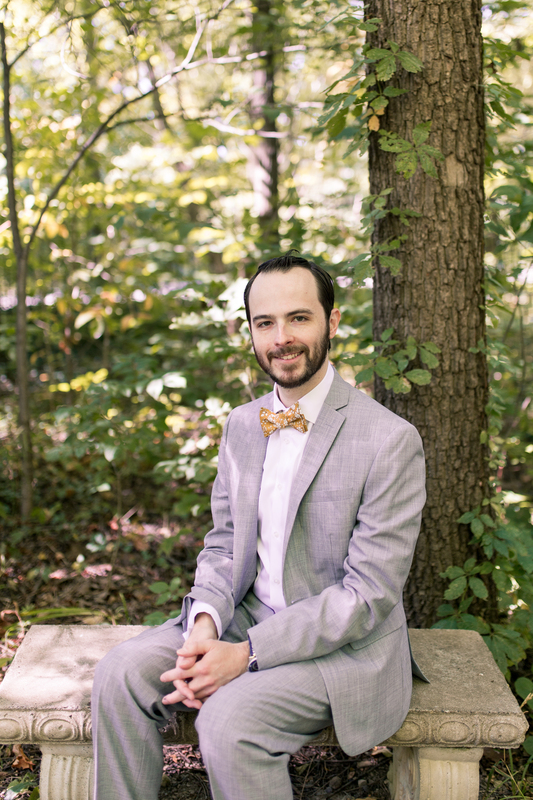 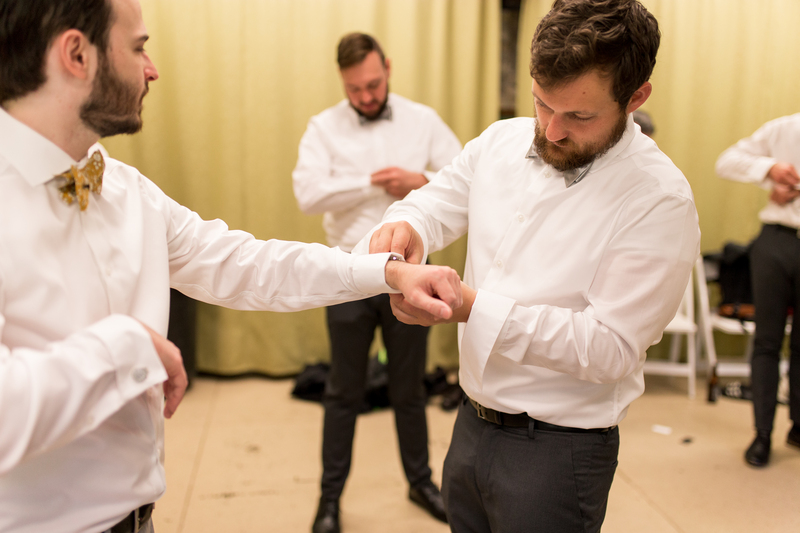 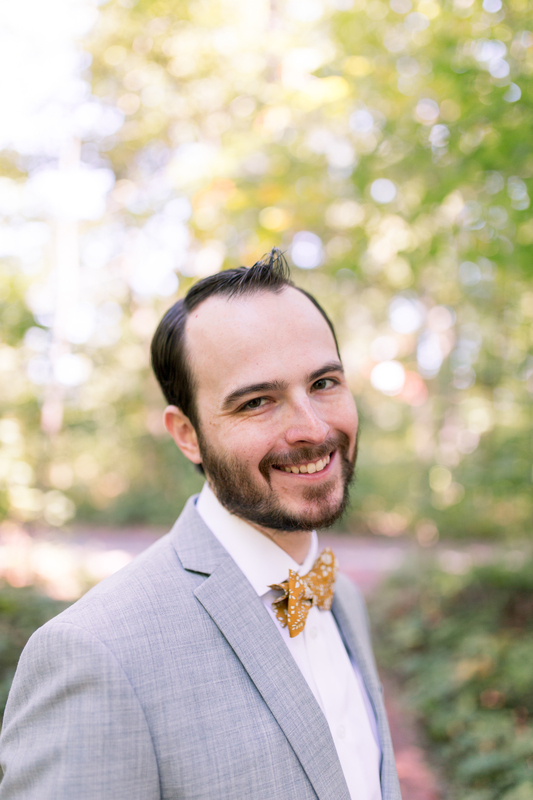 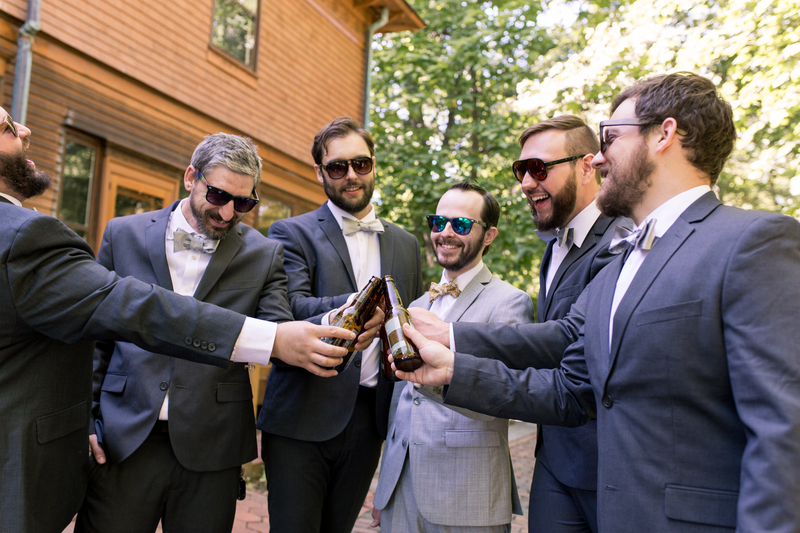 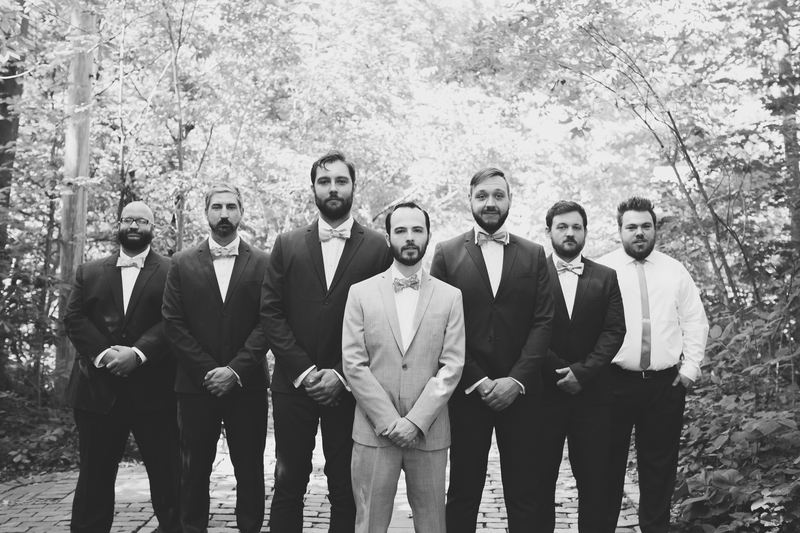 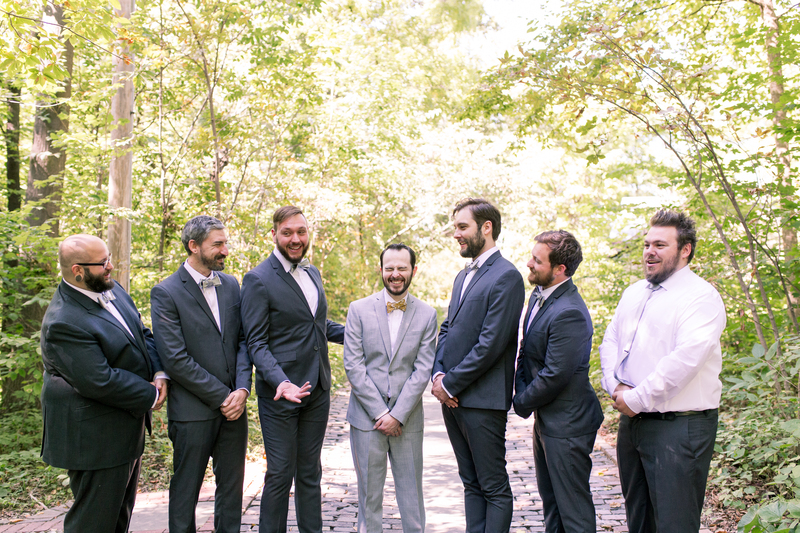 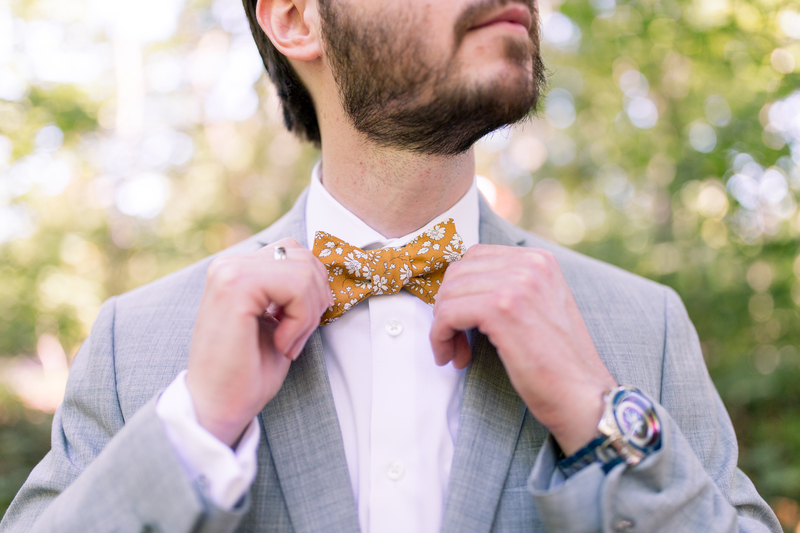 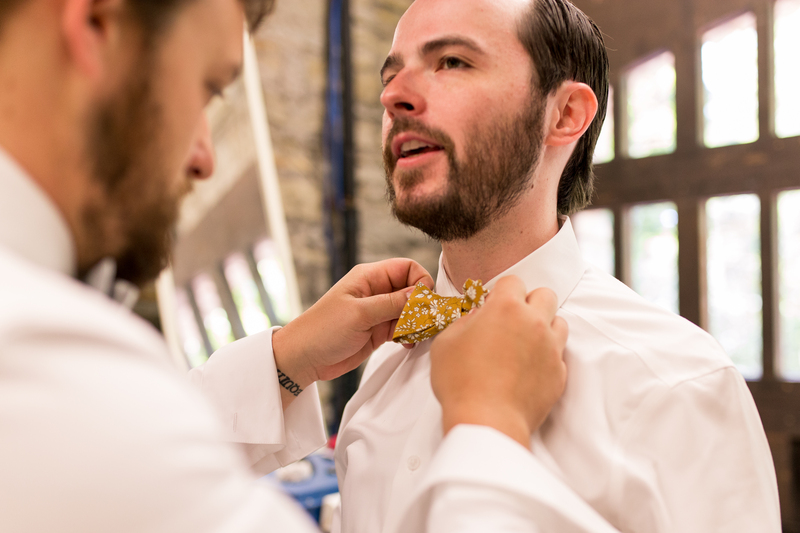 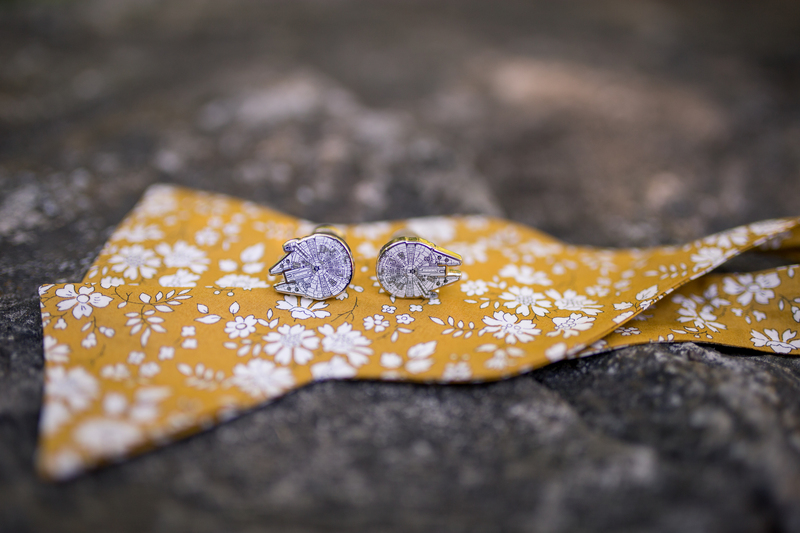 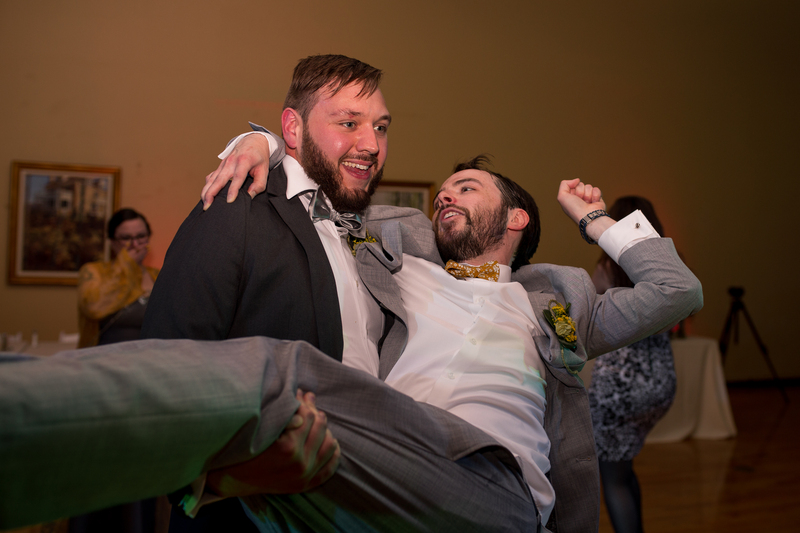 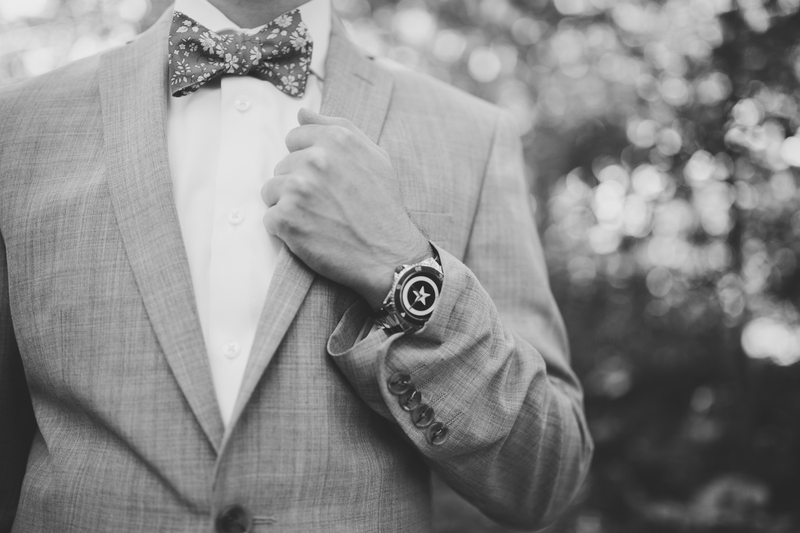 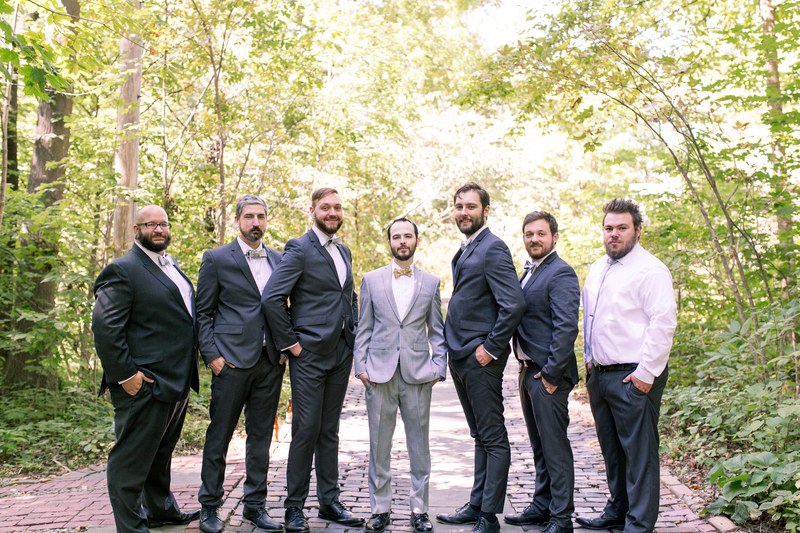 Aaron gifted the groomsmen with cufflinks and the ushers with tie clips – both from Star Wars. 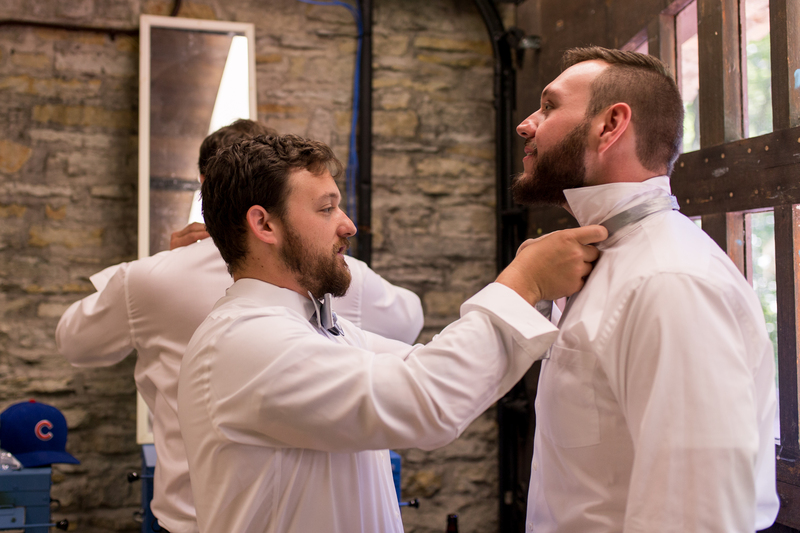 We enjoyed watching the guys judge who had the best bowtie and spending time laughing with them throughout their portraits. 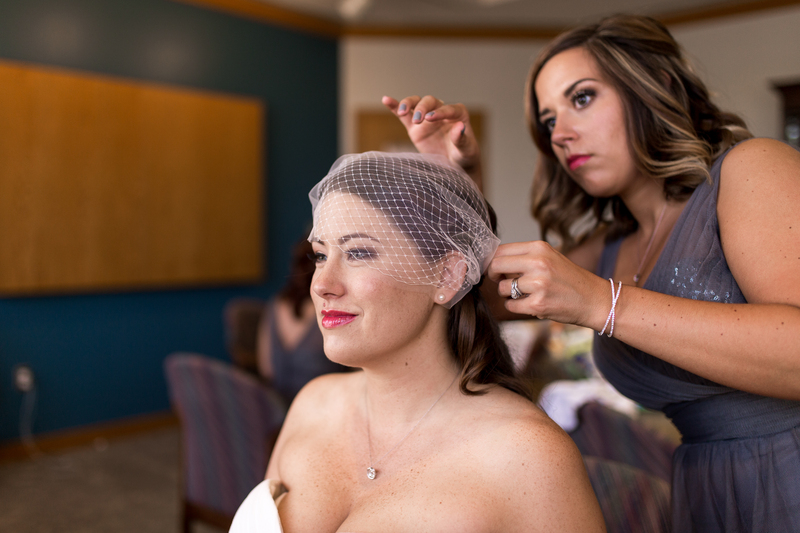 As the girls and Sara wrapped up their preparations, we headed out for some portraits. 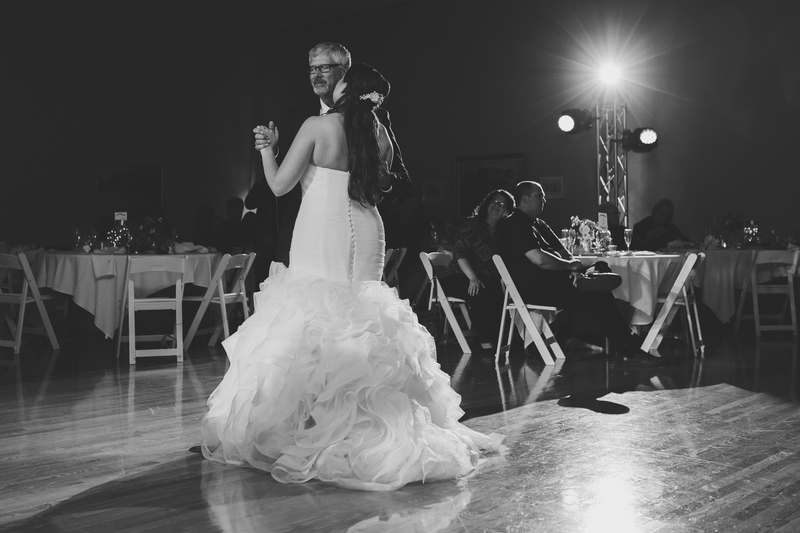 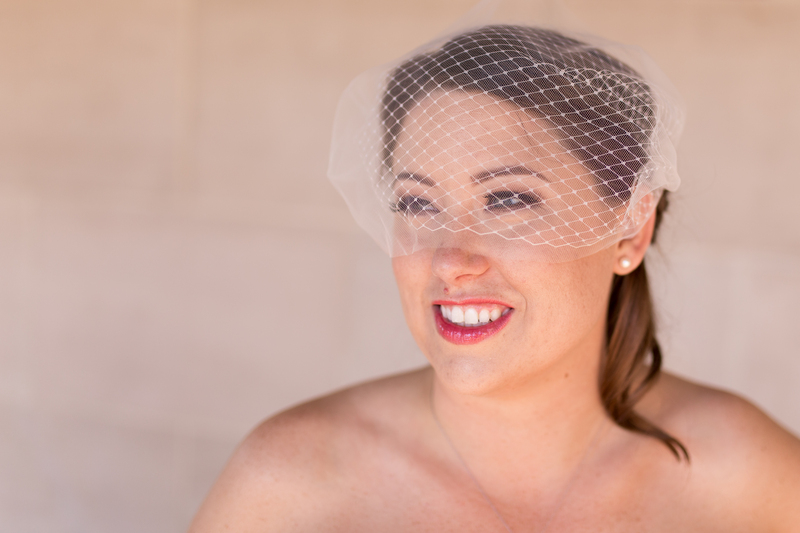 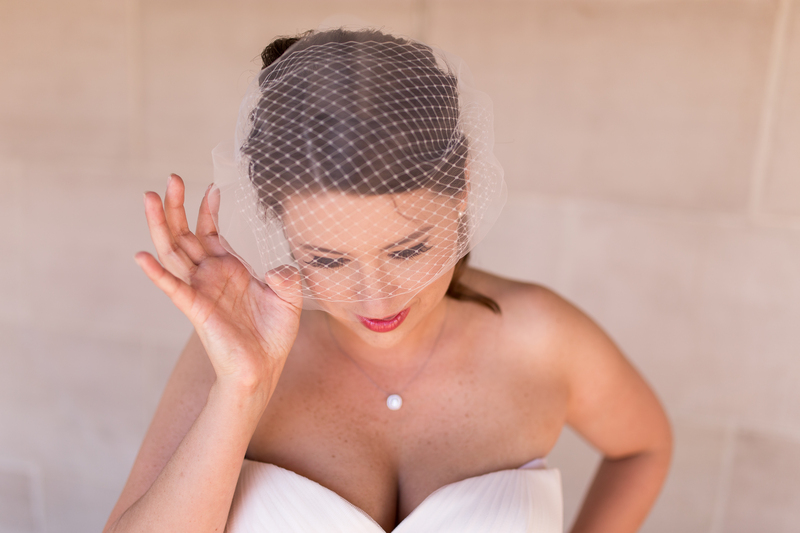 Sara was absolutely radiant, and her birdcage veil was an absolutely stunning addition to her amazingly beautiful dress. 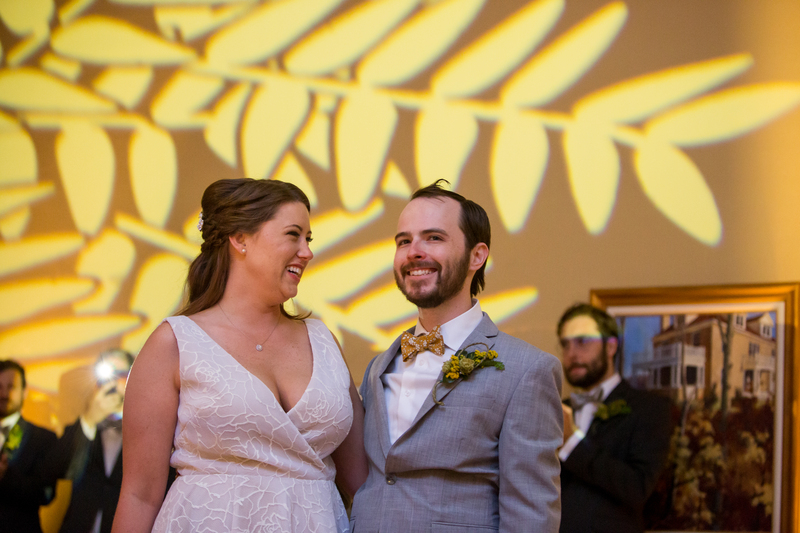 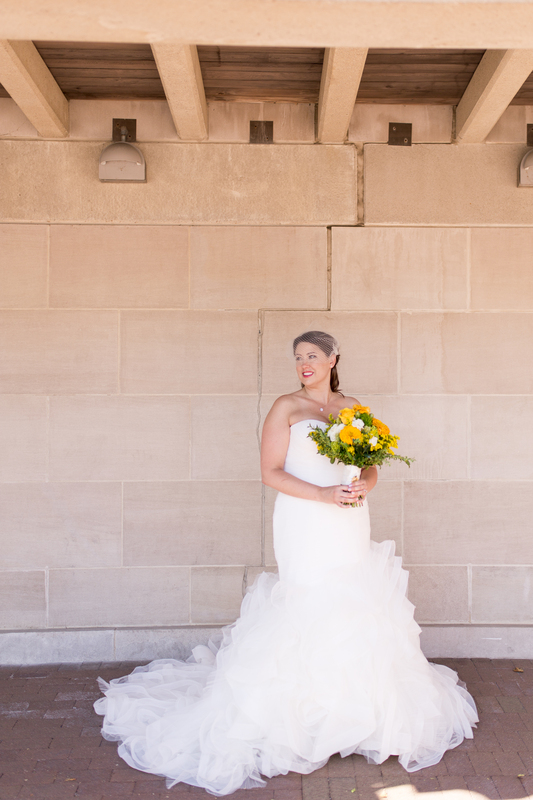 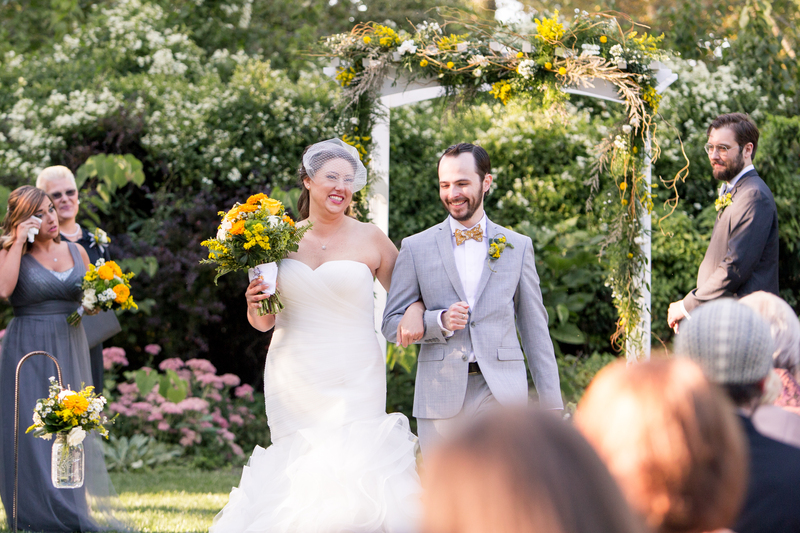 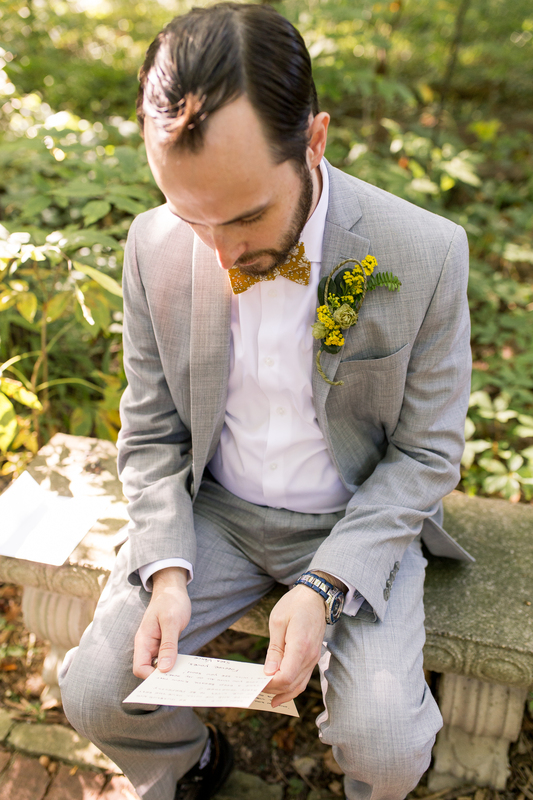 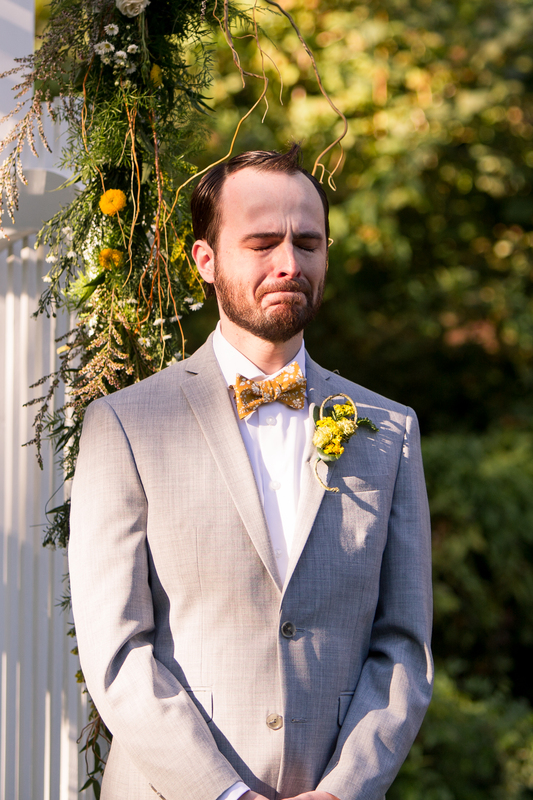 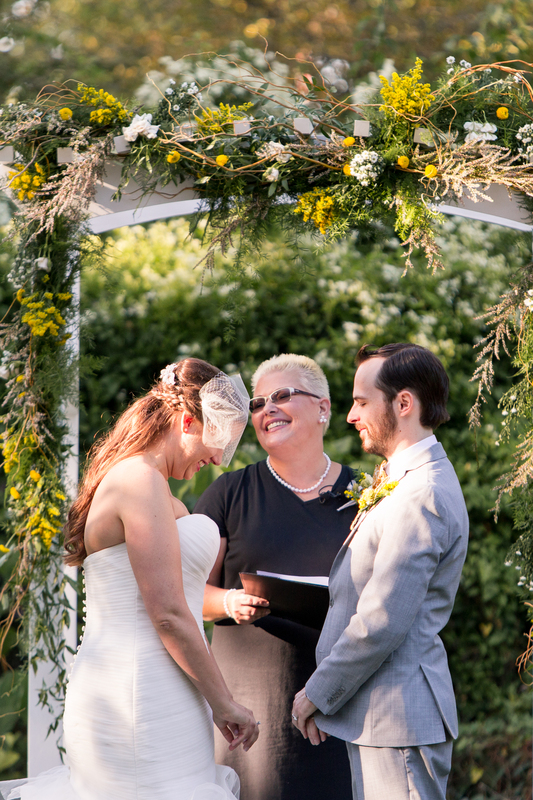 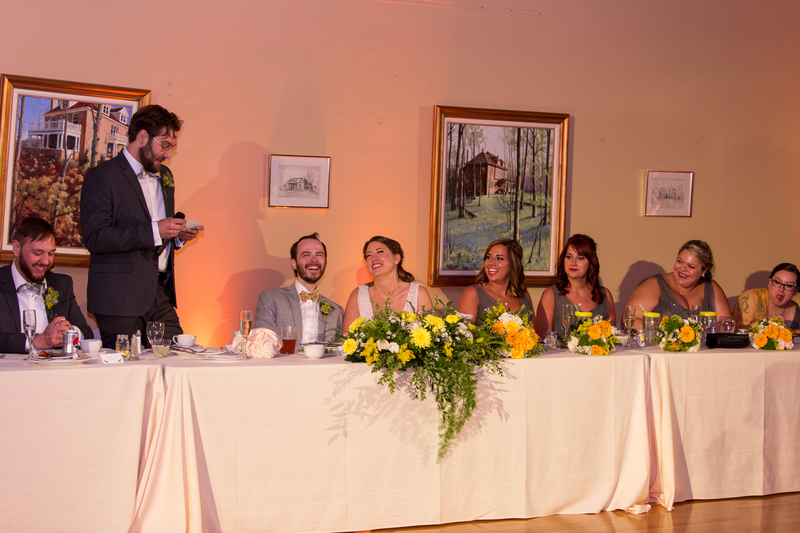 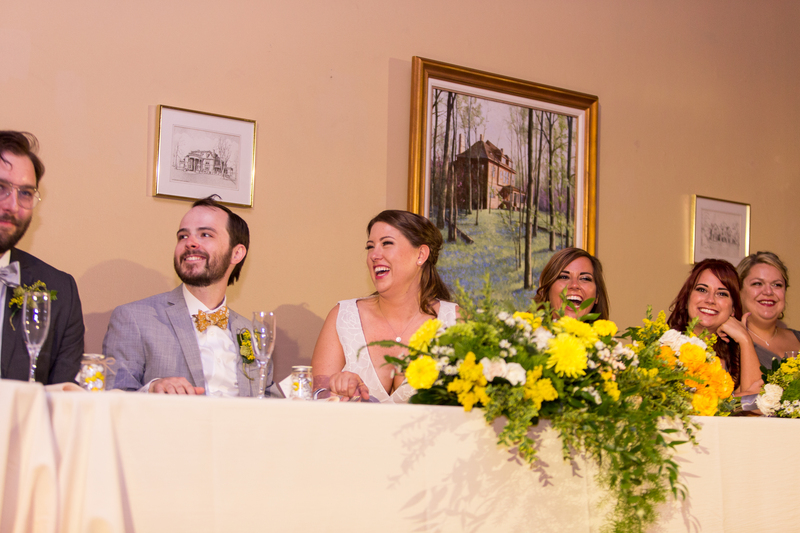 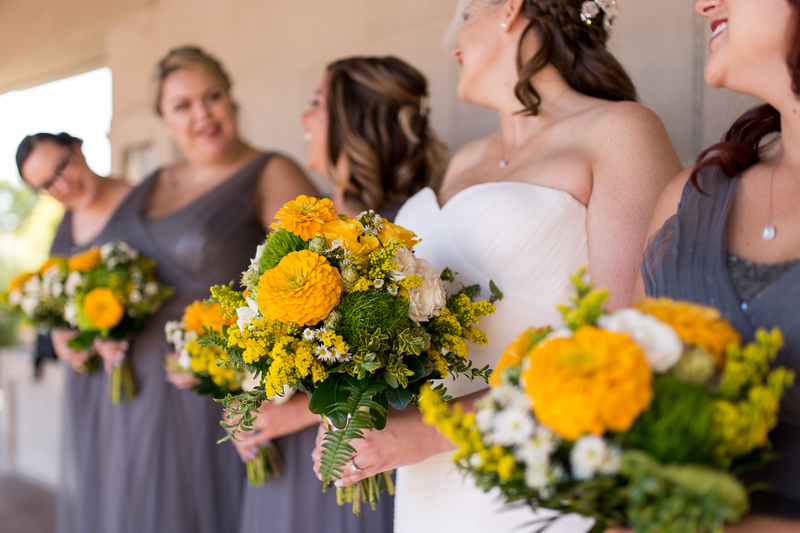 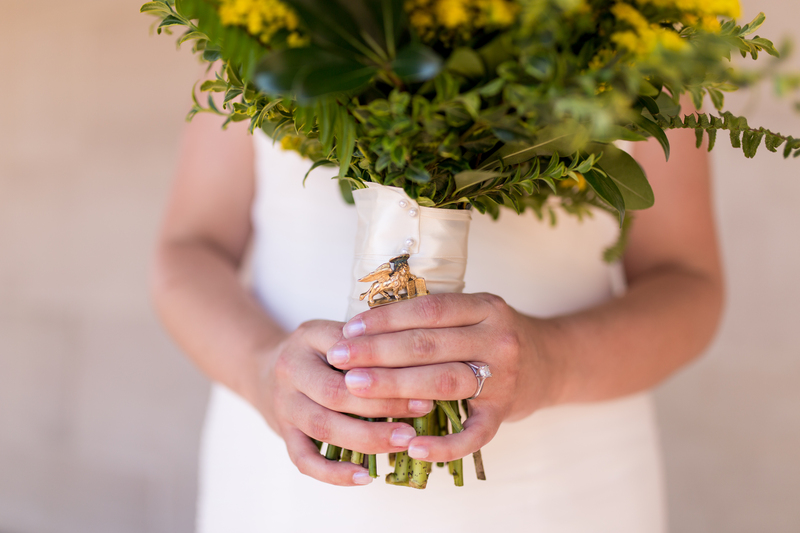 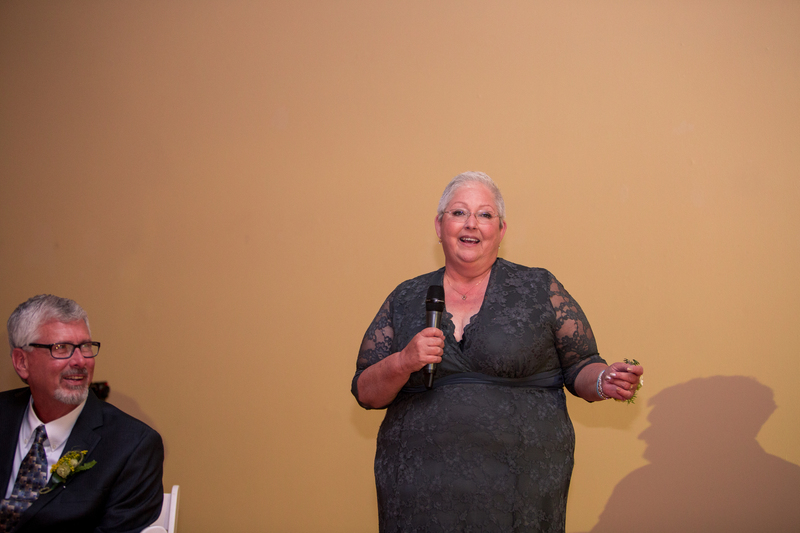 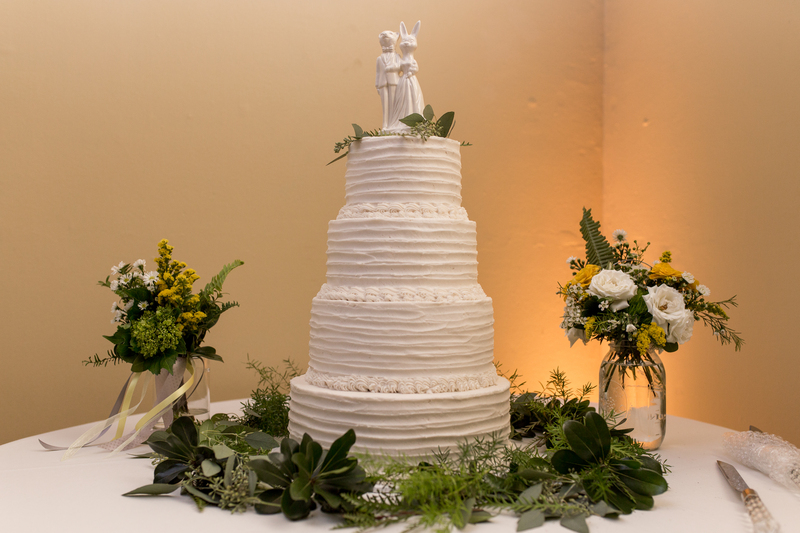 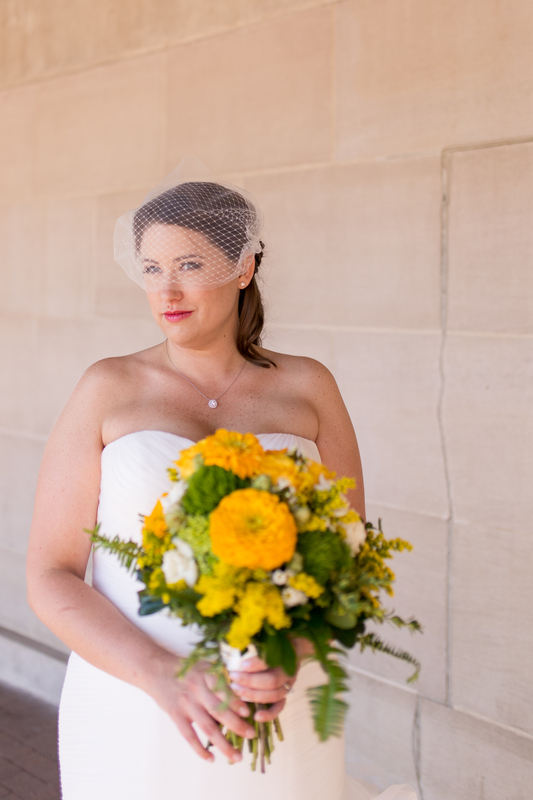 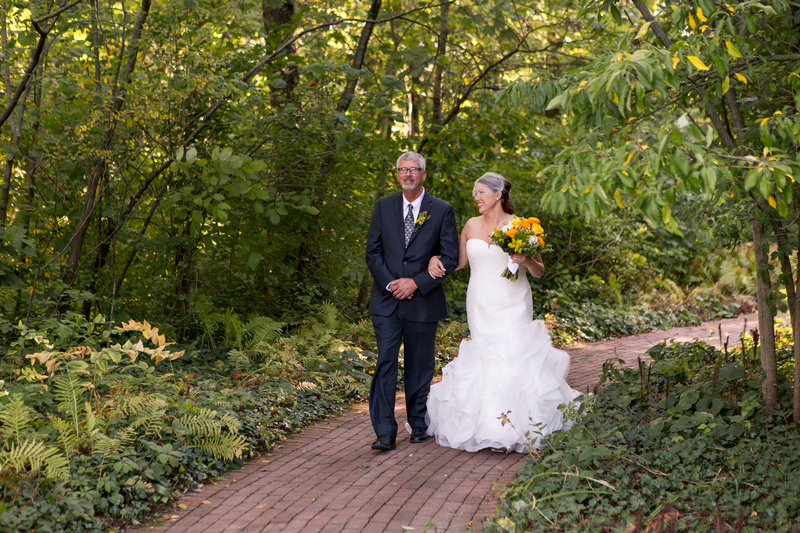 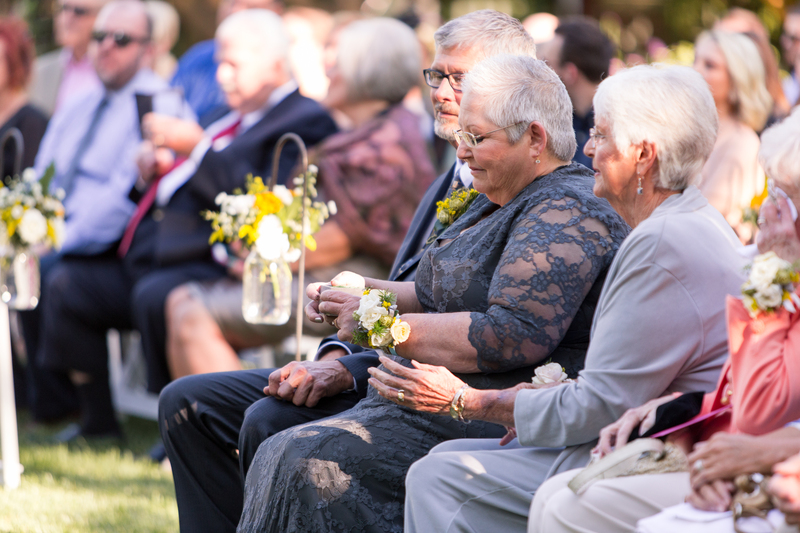 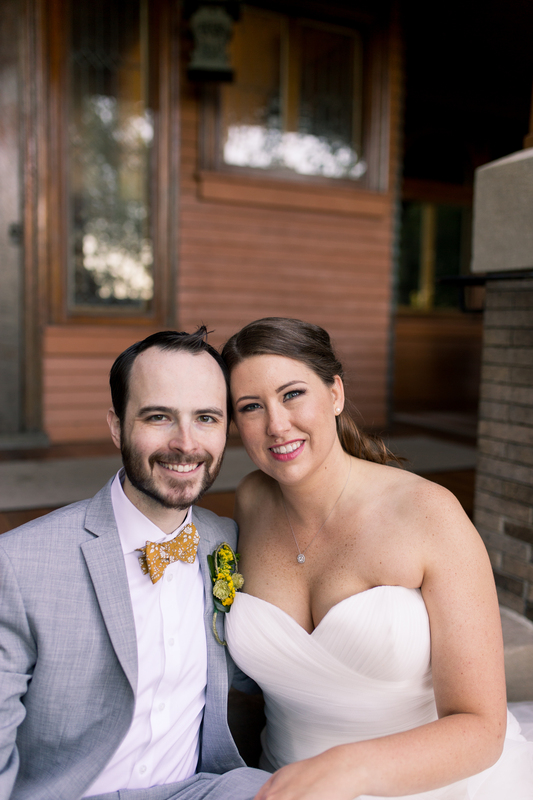 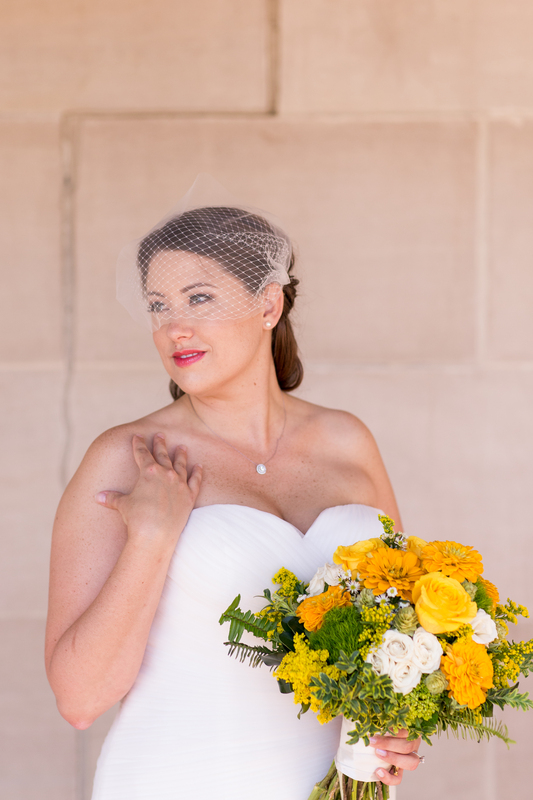 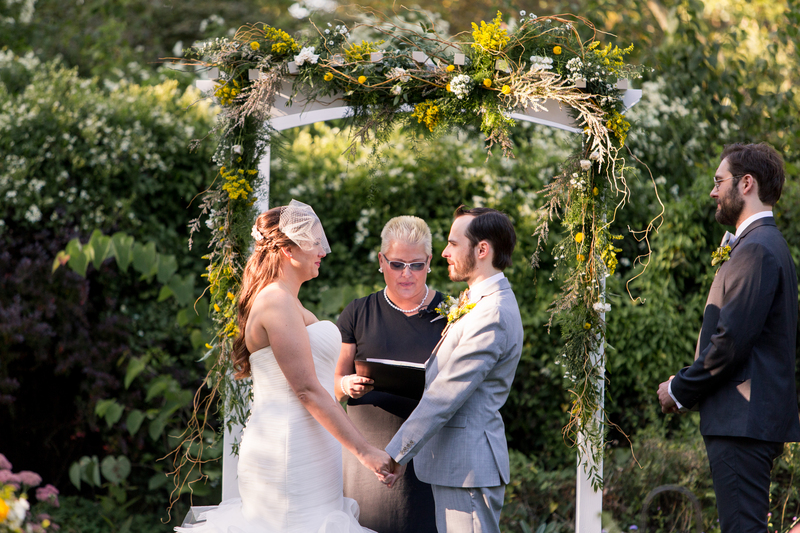 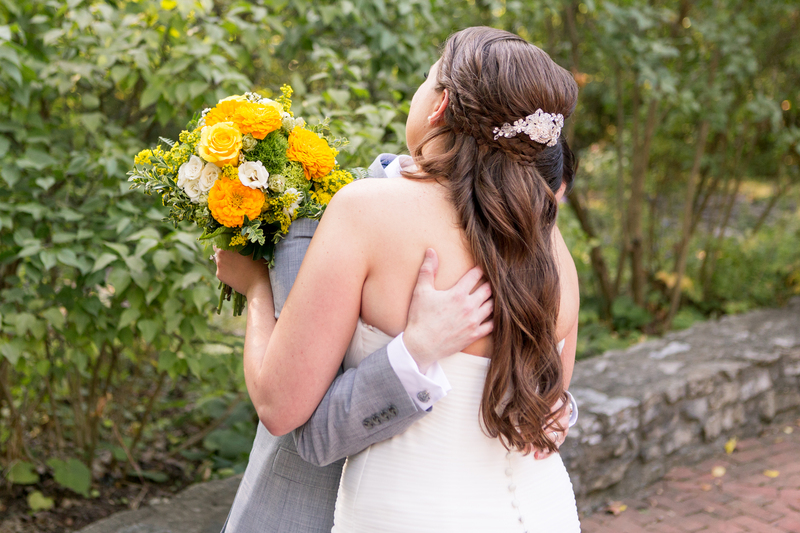 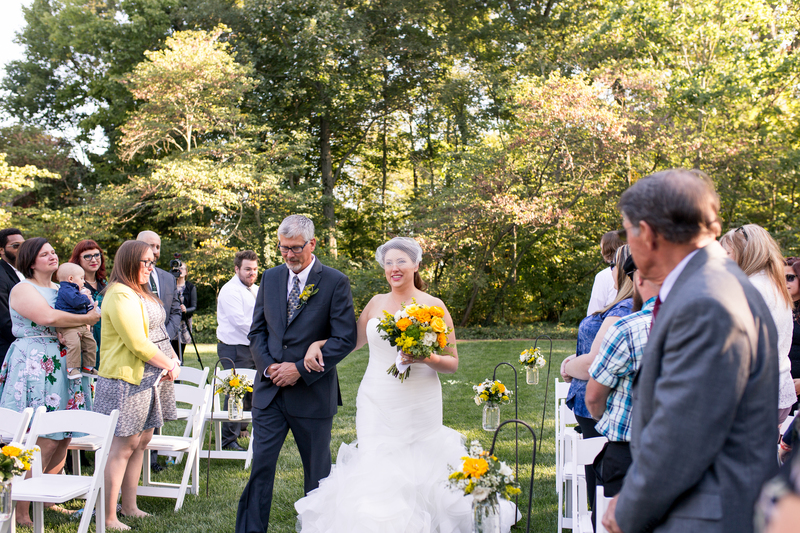 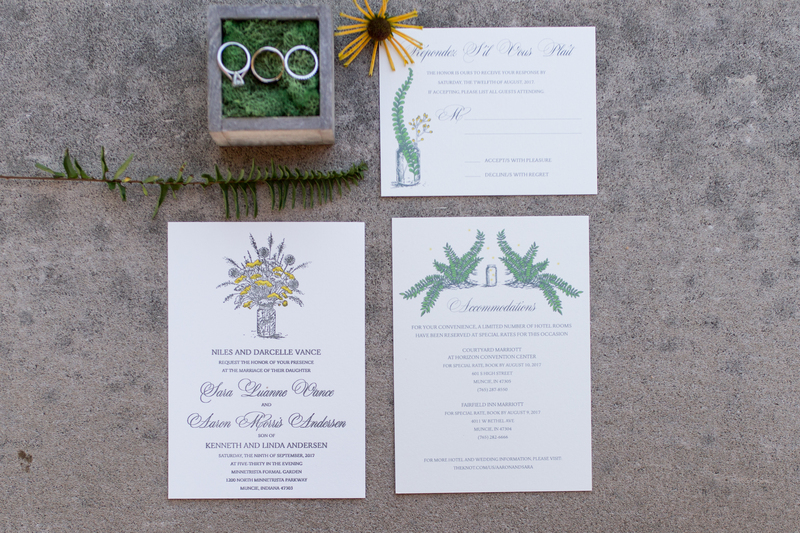 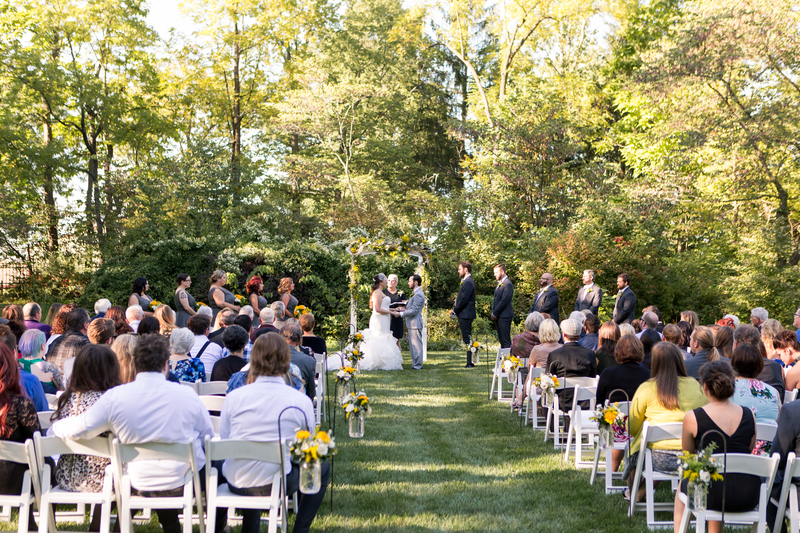 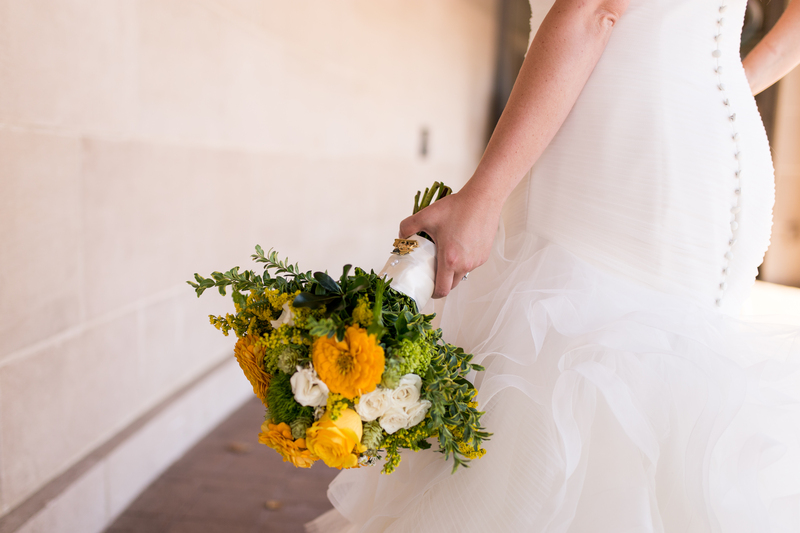 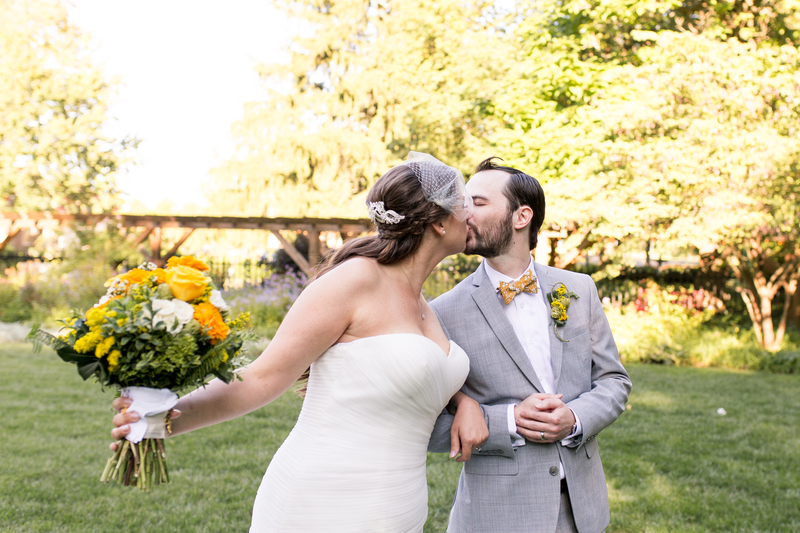 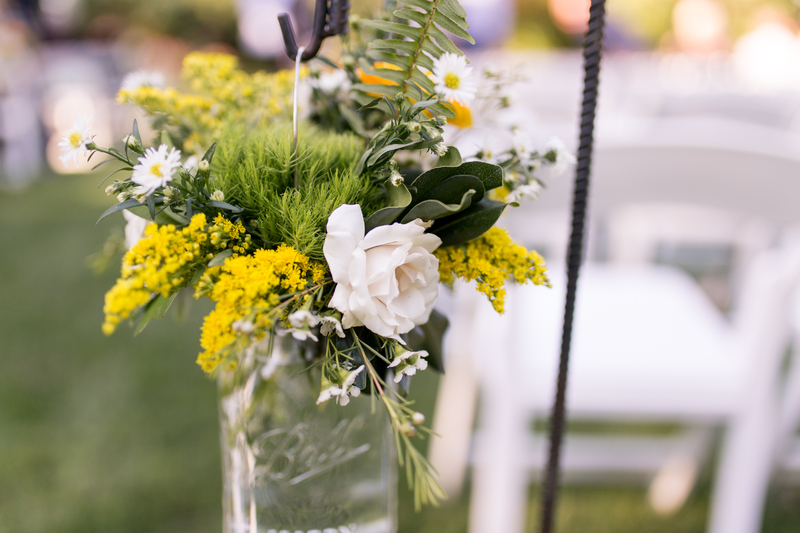 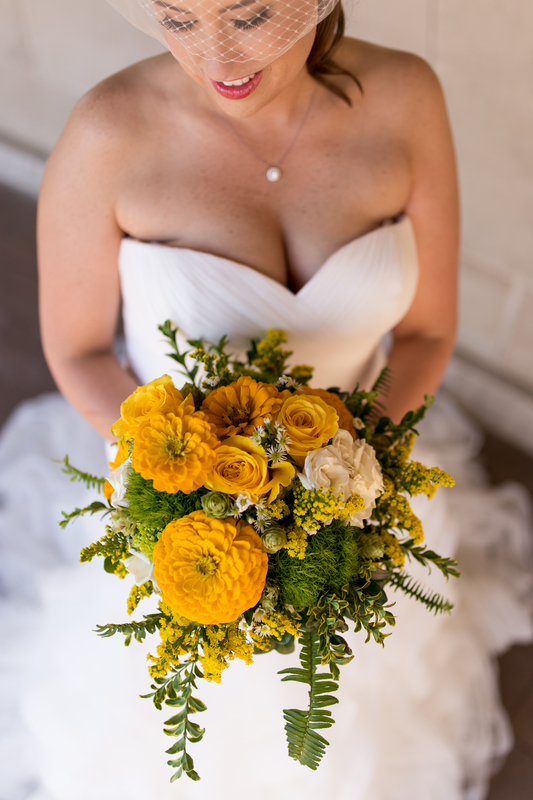 Her golden yellow flowers received many compliments, and they were the perfect choice for their fall garden wedding. 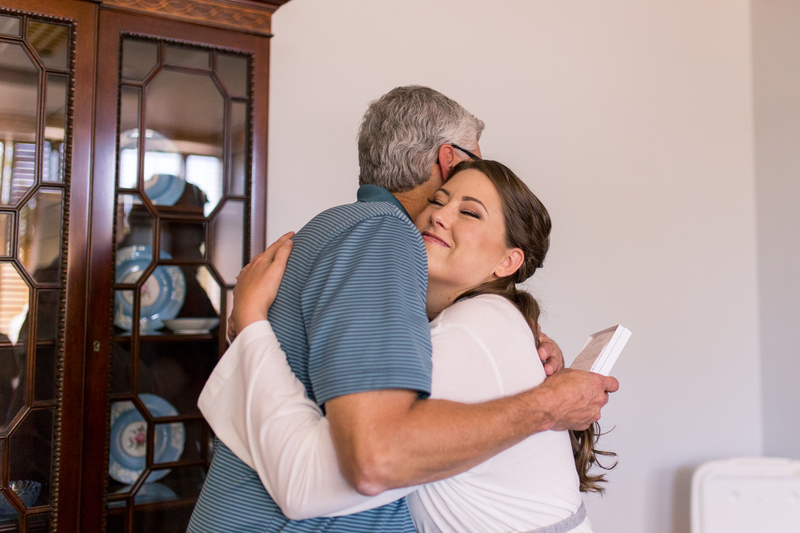 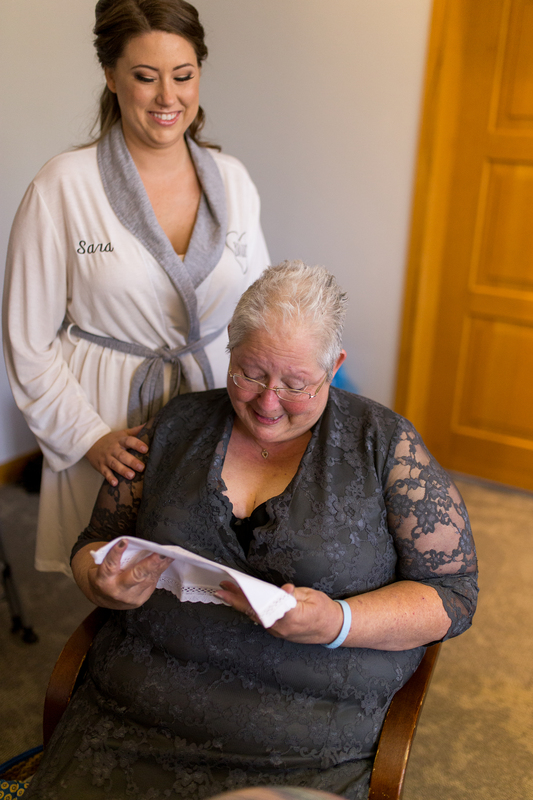 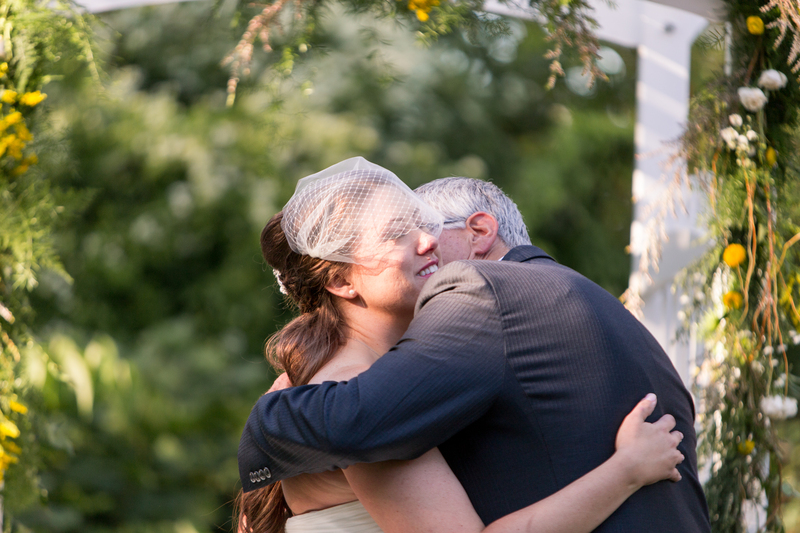 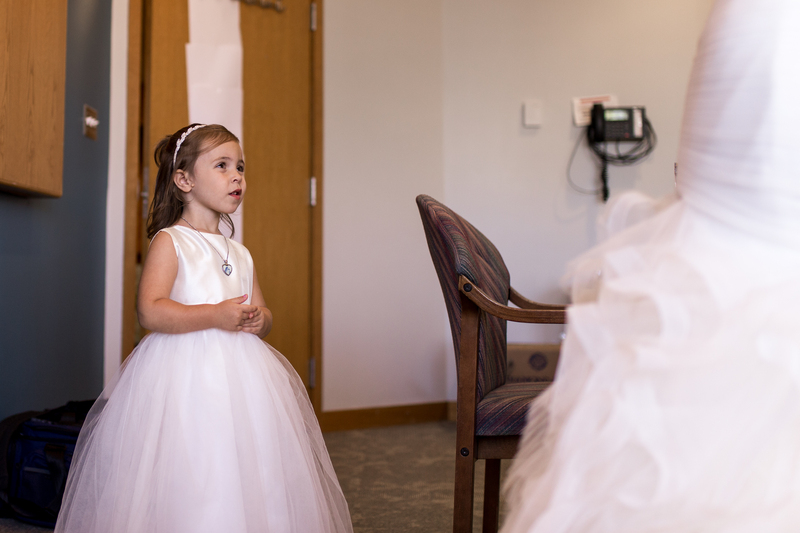 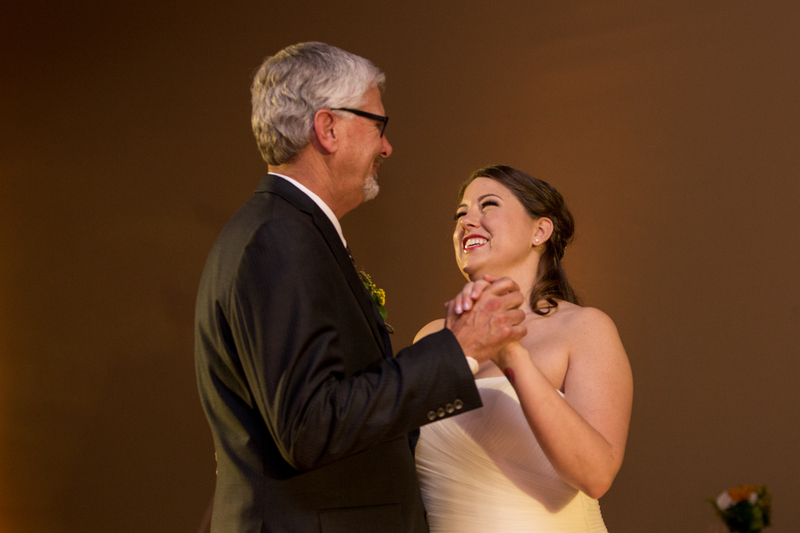 As we headed over to Oakhurst Gardens for the ceremony, I loved seeing Sara so anxious and excited to see her groom. 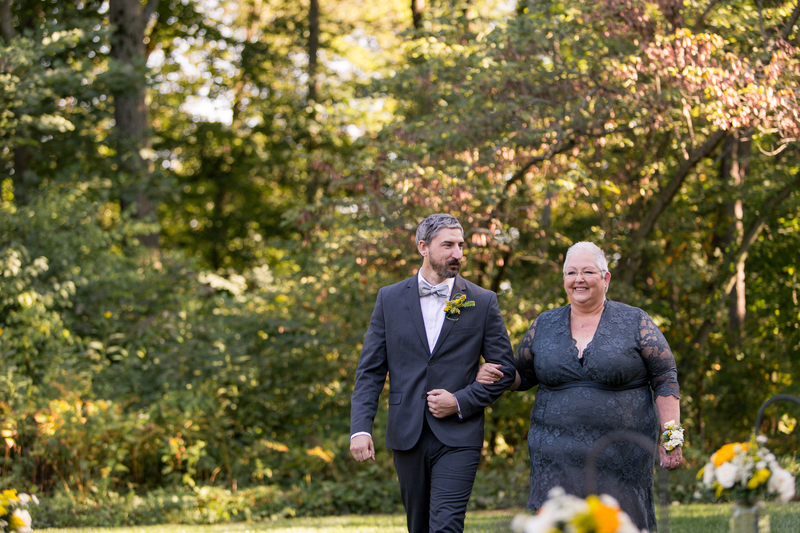 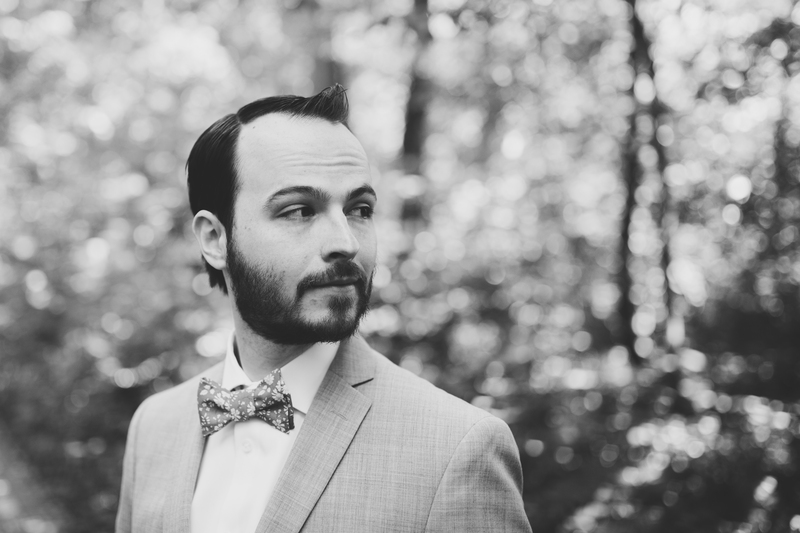 As Aaron stood on the winding path to the ceremony site, it was obvious that he was ready to see his beautiful bride-to-be walk toward him down the aisle. 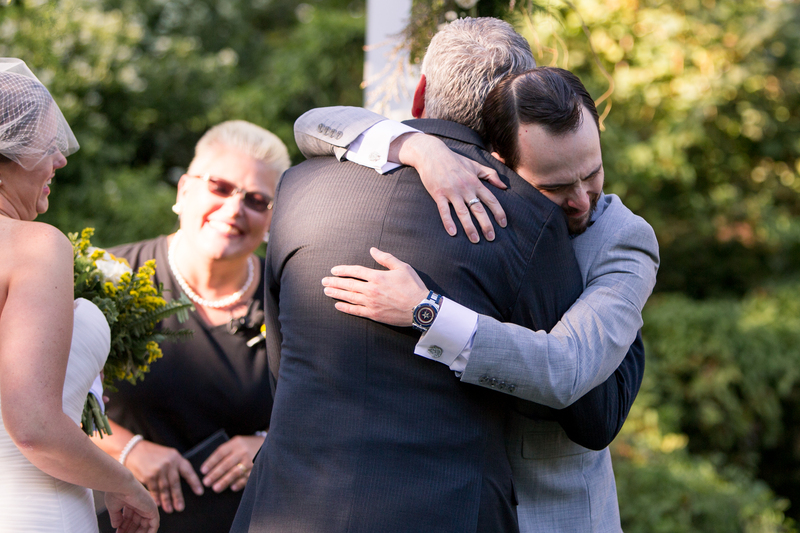 As Sara arrived, Aaron’s reaction was such a sweet one to witness, as his eyes welled with tears at the sight of her. 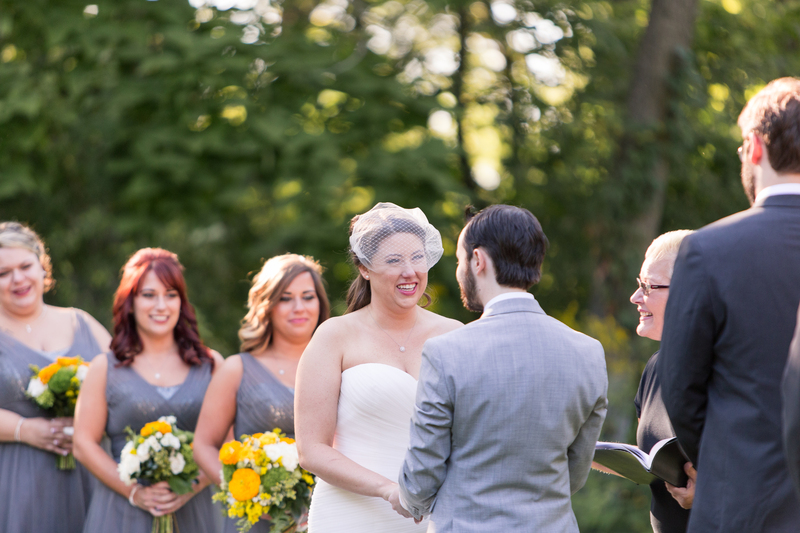 One of my favorite parts of their ceremony was the ring warming, which was such a uniquely sweet moment they shared with their guests. 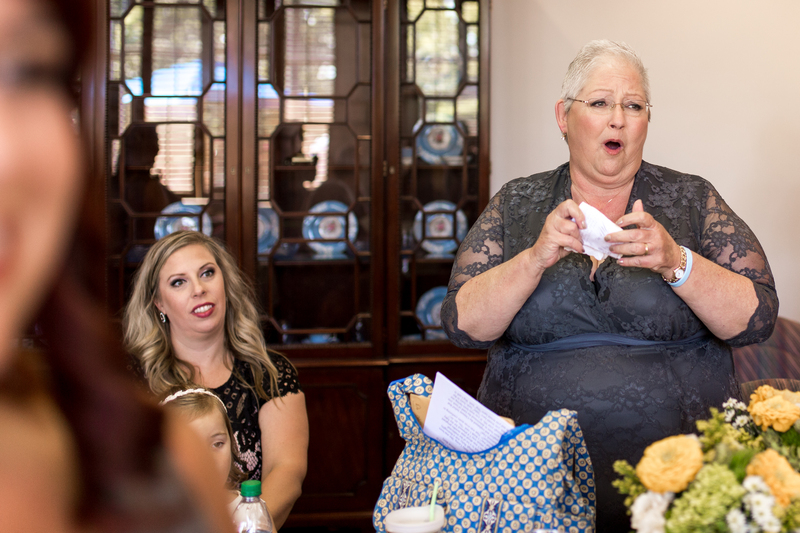 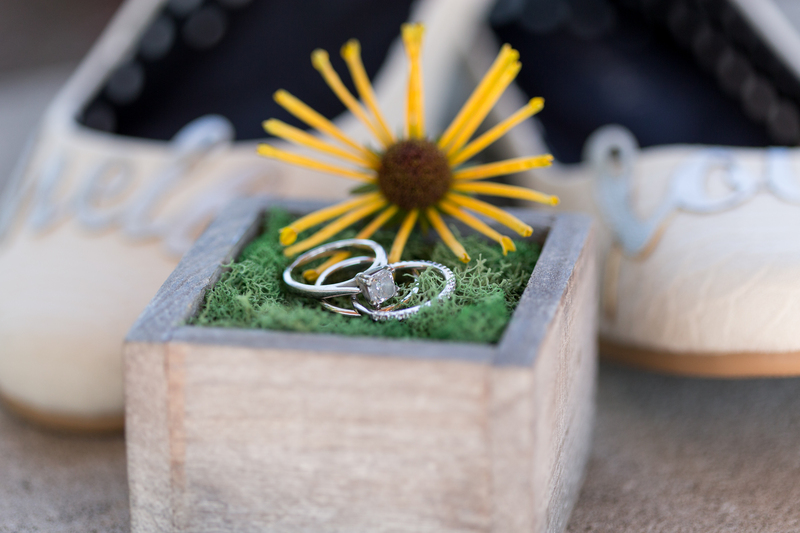 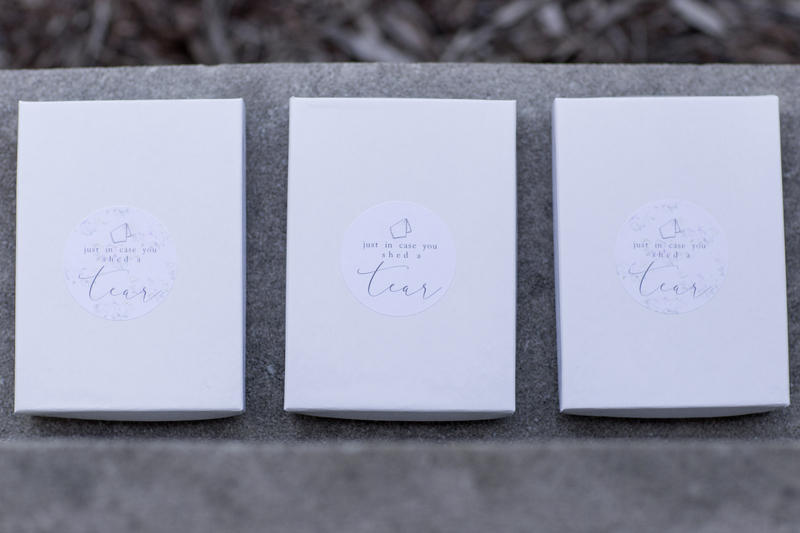 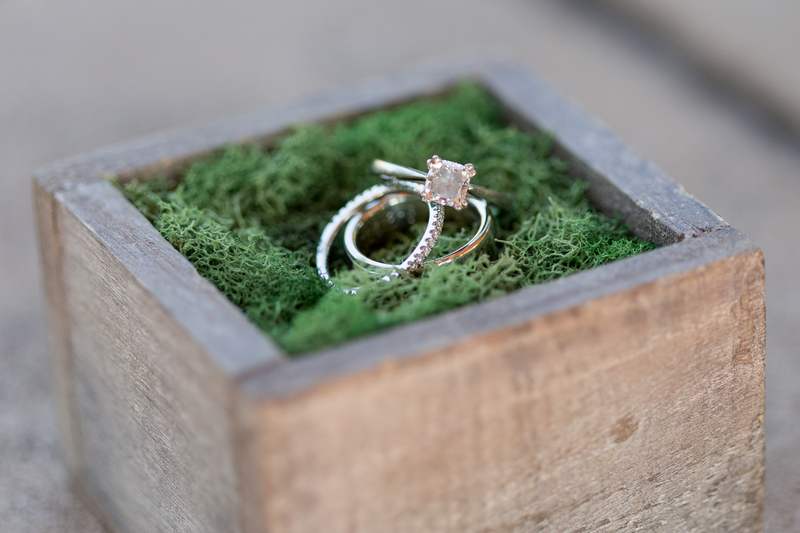 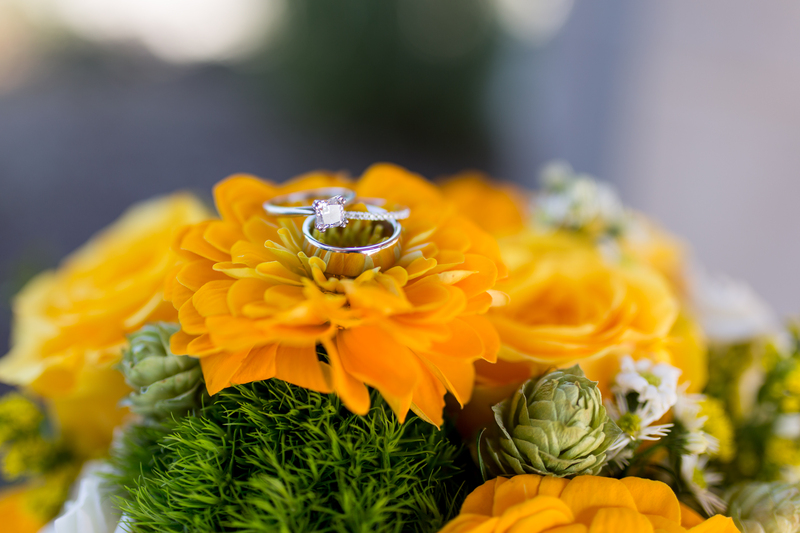 They passed their wedding bands through the audience in a moss-filled box and asked their family and friends to “warm” the rings with prayers, positive thoughts, and wishes for their marriage. 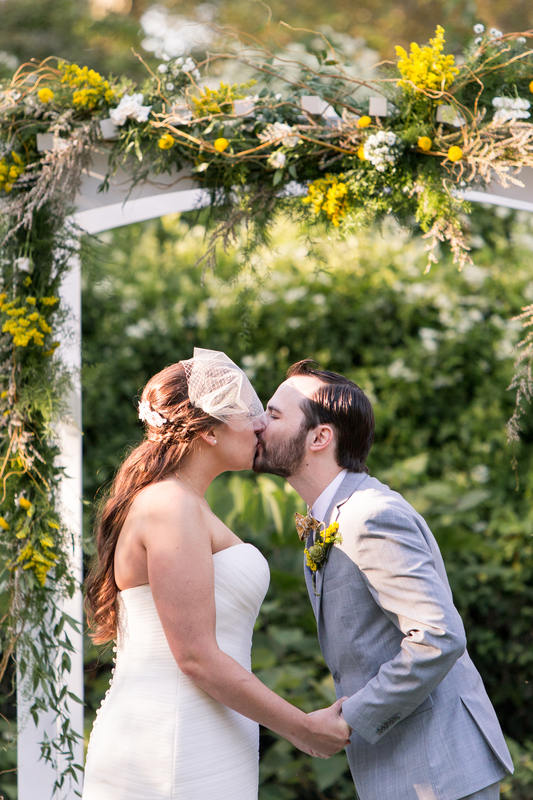 Aaron finally got to kiss his bride, surrounded by their closest family and friends, who cheered as soon as they were pronounced husband and wife. 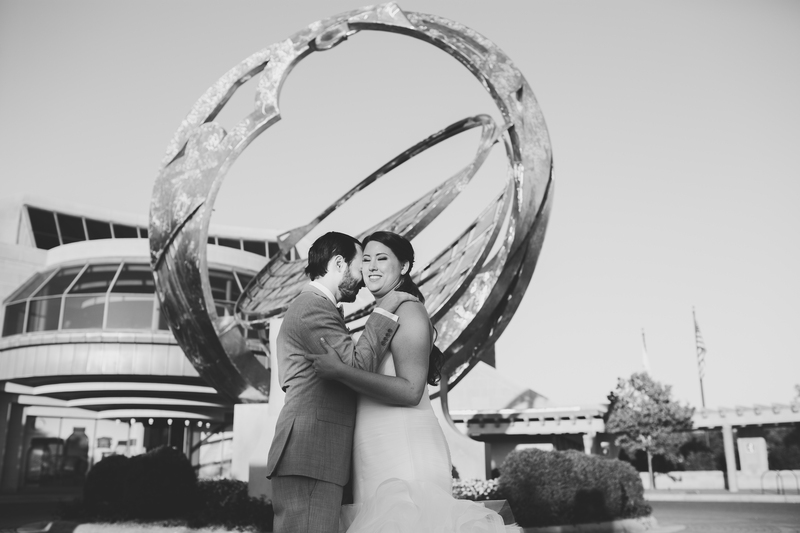 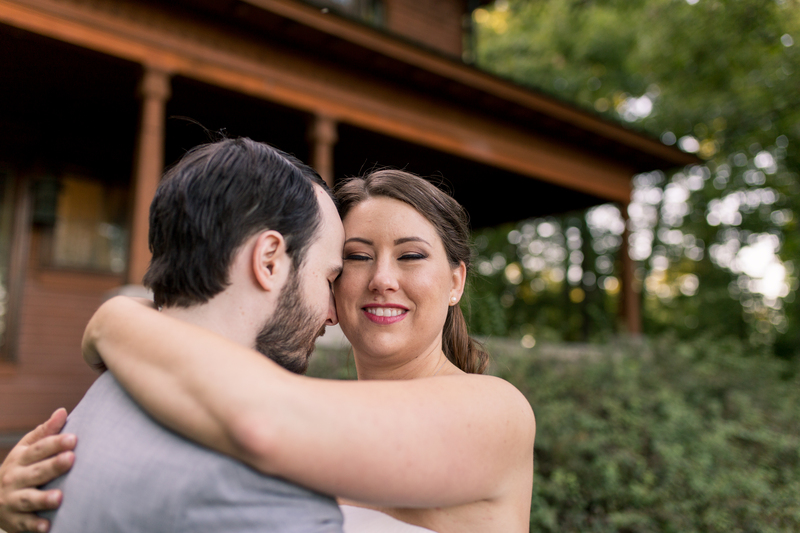 After we wrapped up their portraits, Sara and Aaron headed off to prepare for their big reception entrance. 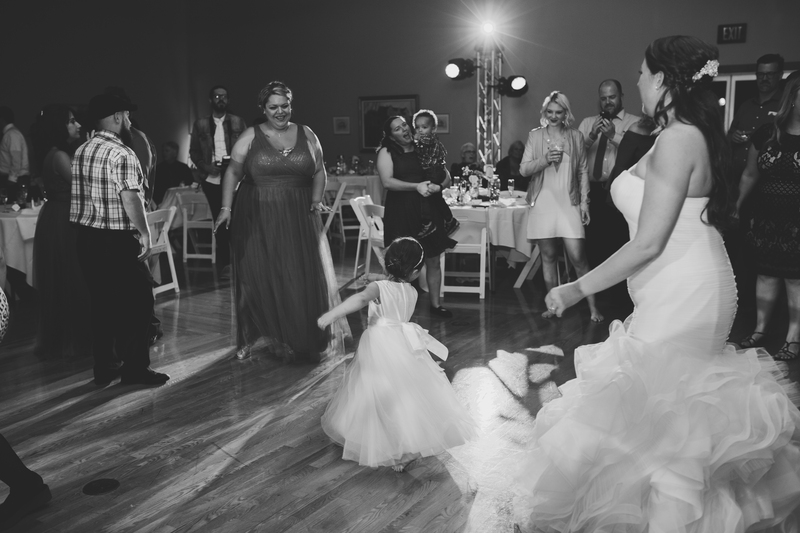 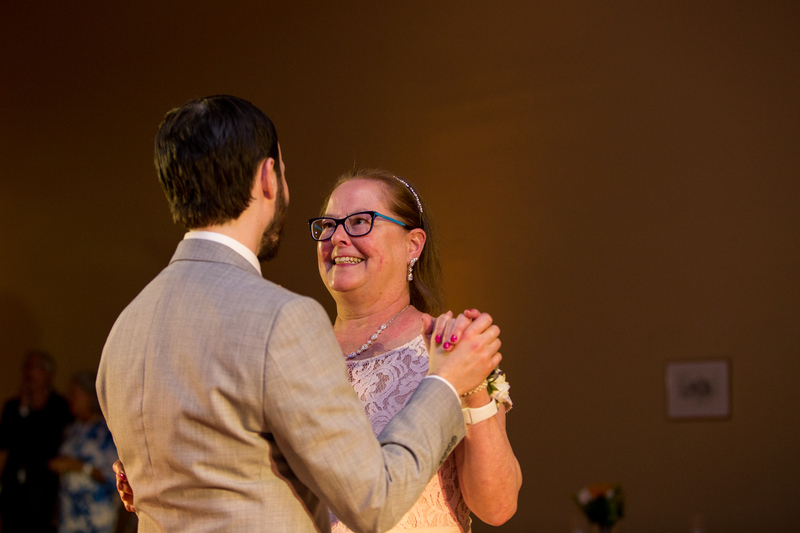 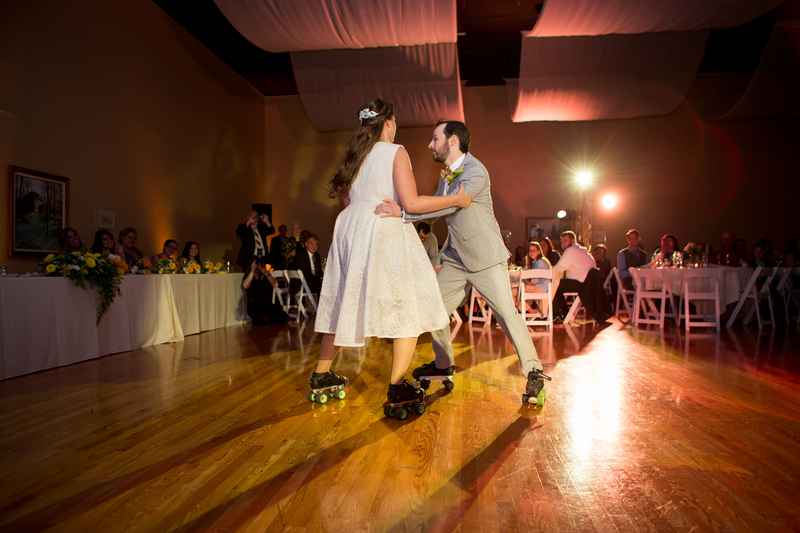 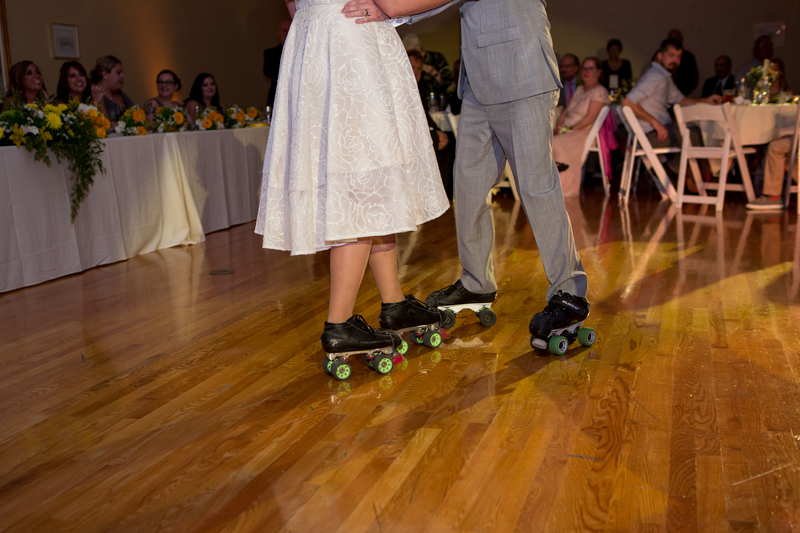 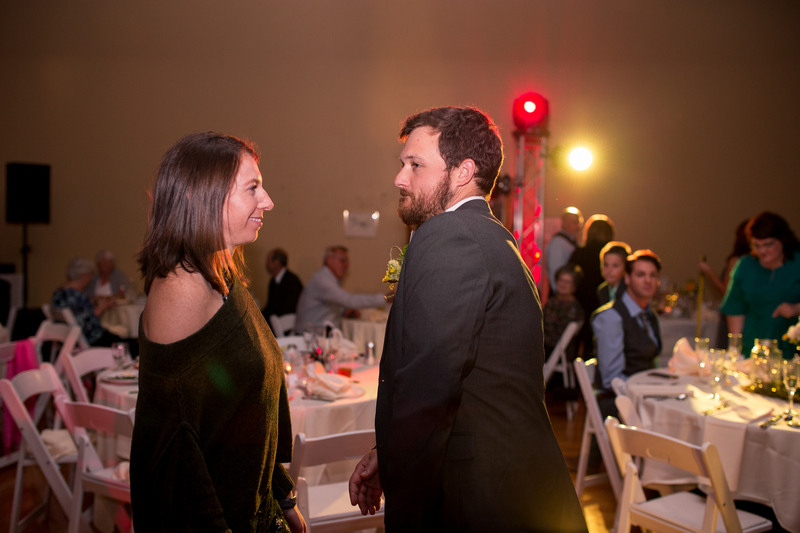 Sara is involved in roller derby, so they surprised their guests by sharing their first dance on roller skates. 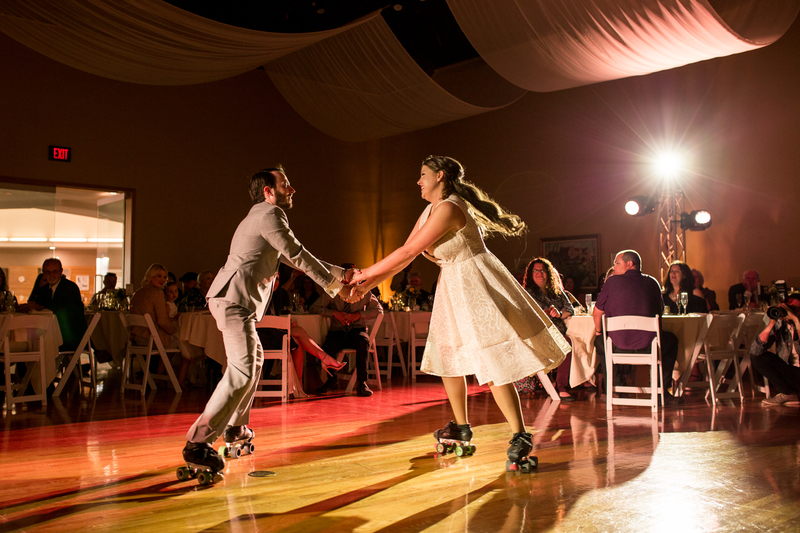 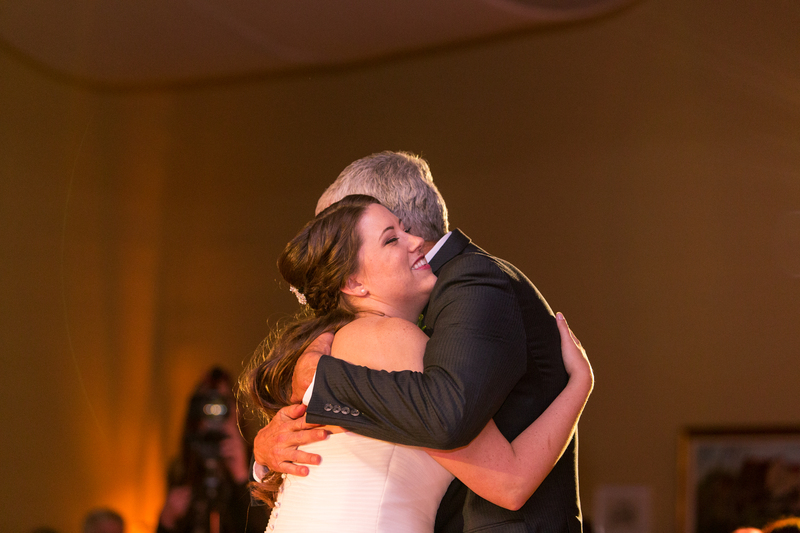 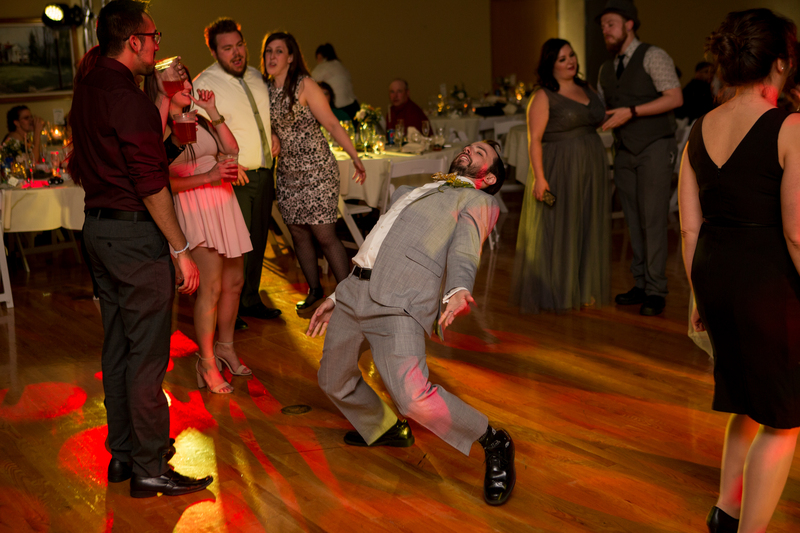 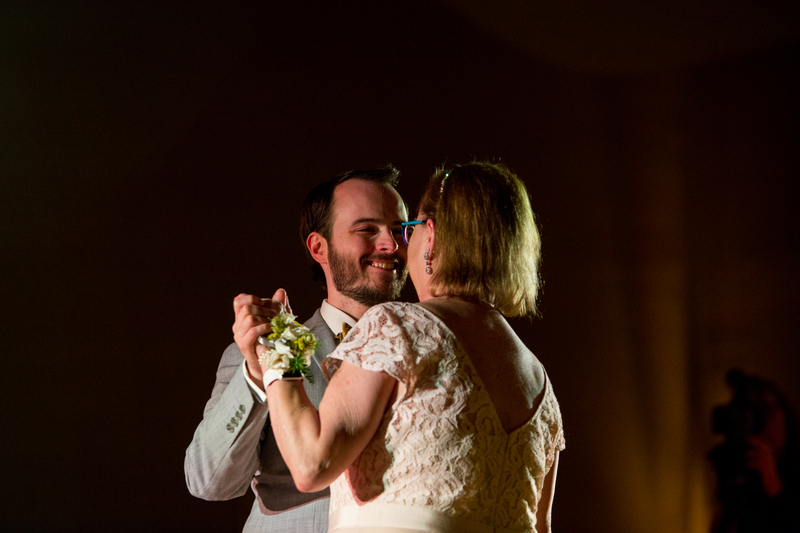 This may take the top of the list for coolest first dance ever! 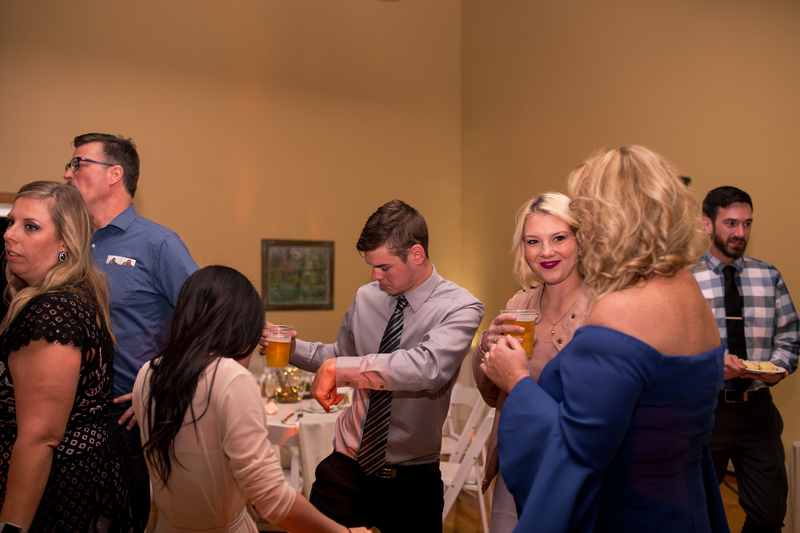 Since Aaron and Sara’s engagement session at LaOtto Brewing, I had been excited for their reception, where they served the beer they brewed together, surrounded by their friends. 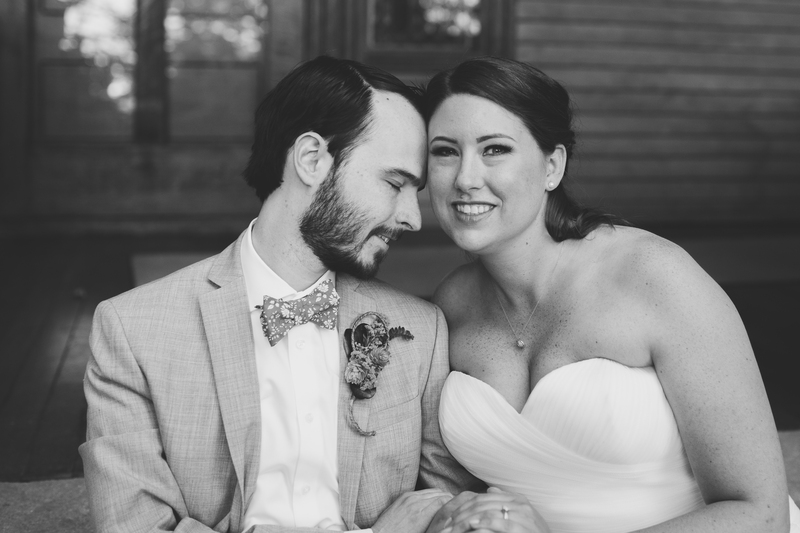 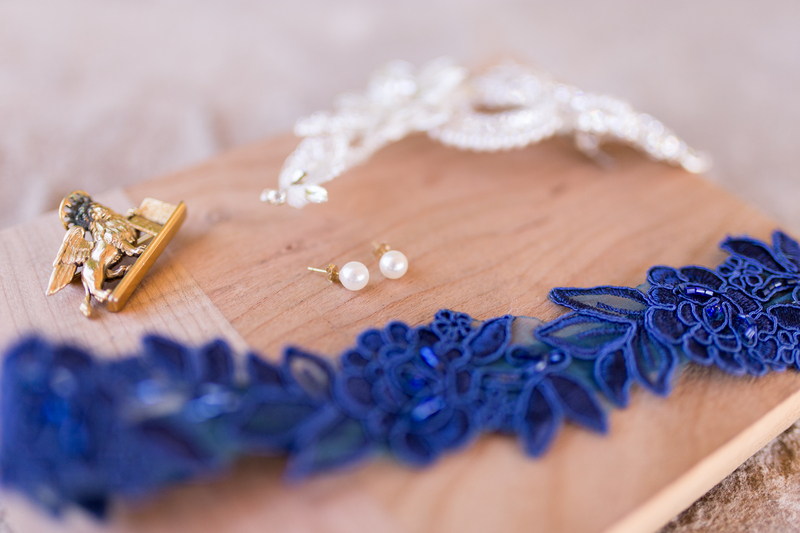 Click here to see their engagement session! 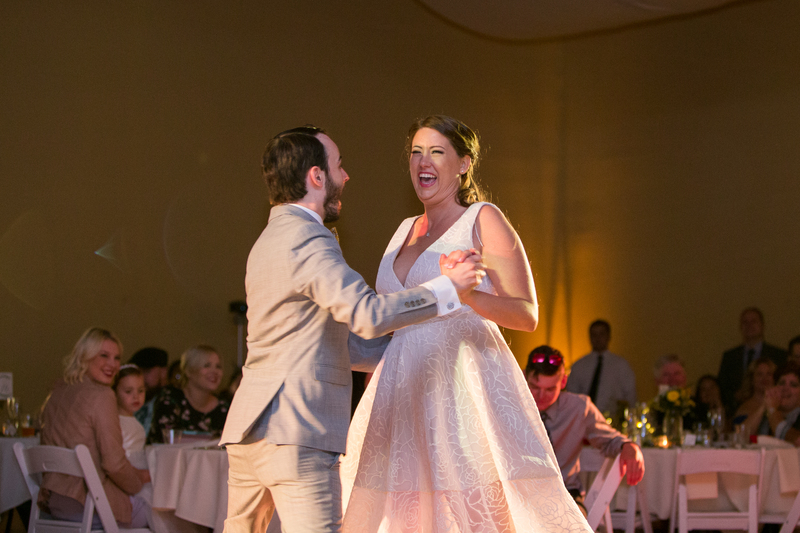 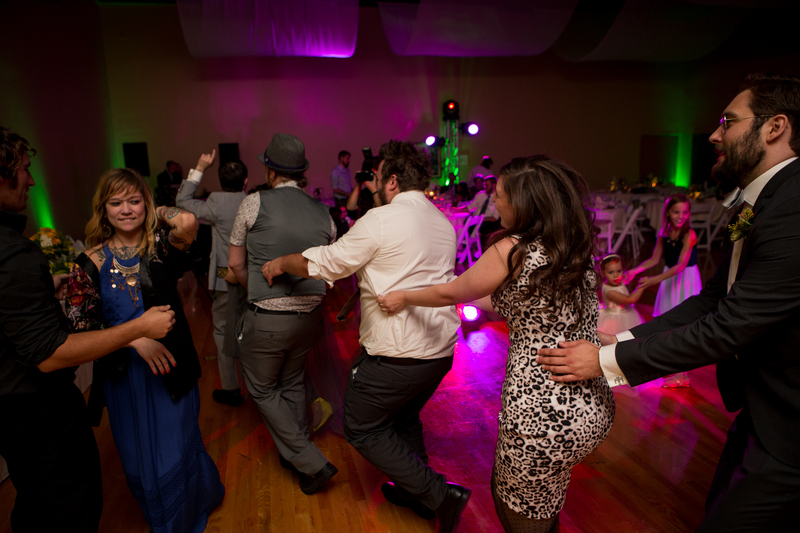 After the cake had been cut and the toasts were given, the dance floor opened up and their friends and family filled the floor with laughter and amazing dance moves for the rest of the evening. 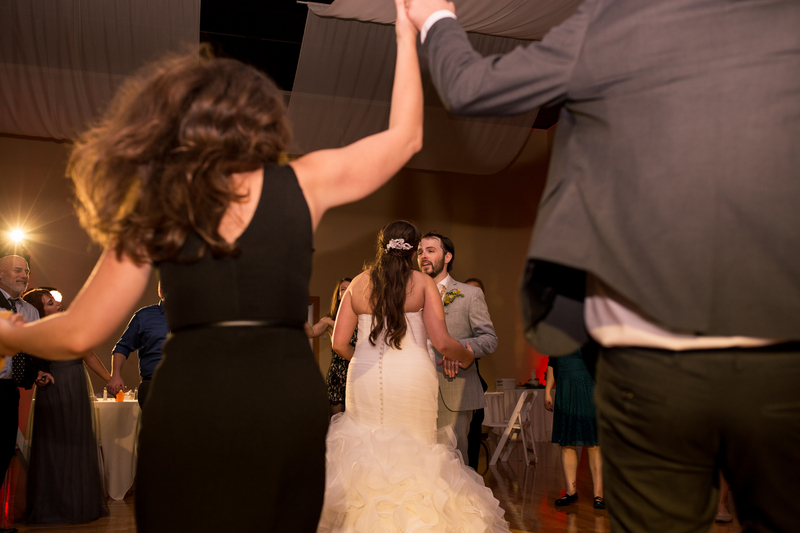 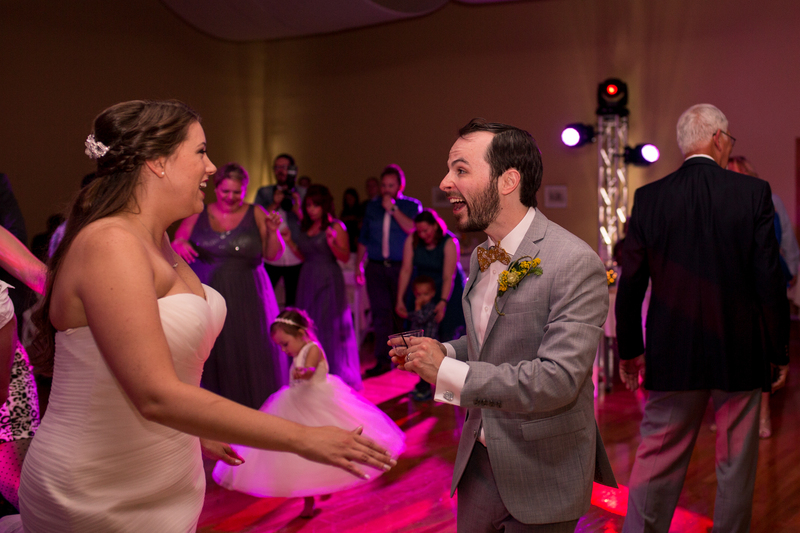 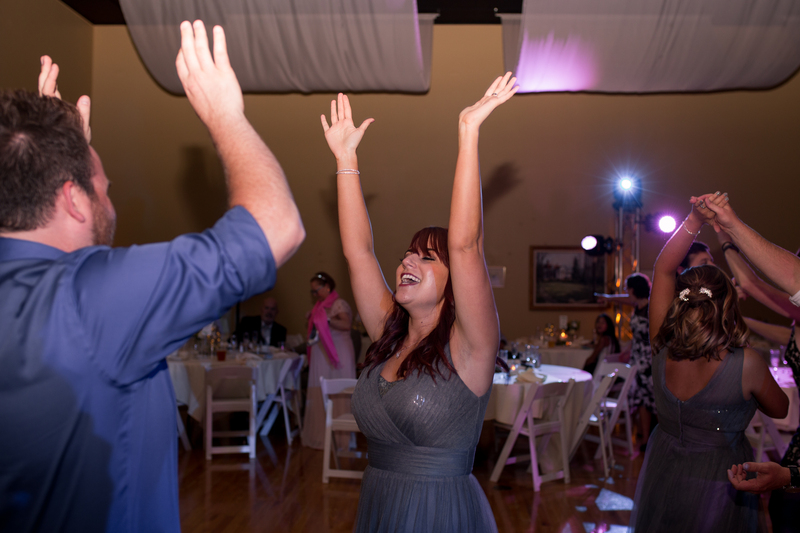 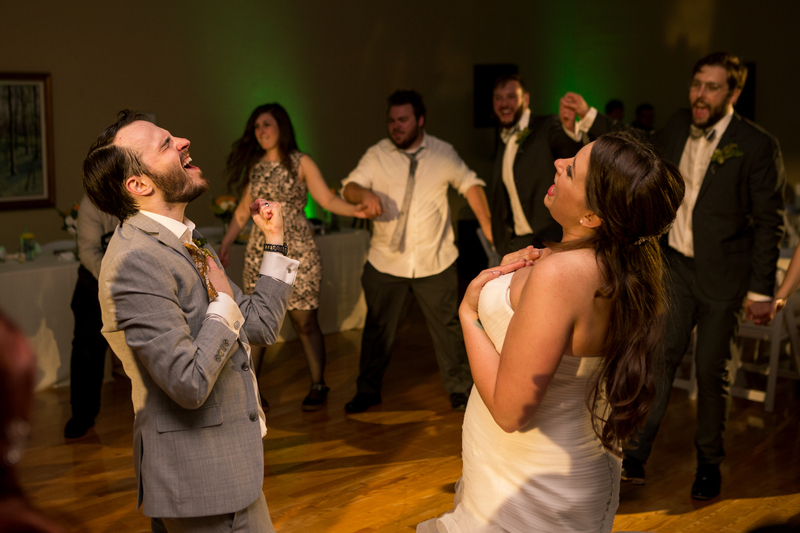 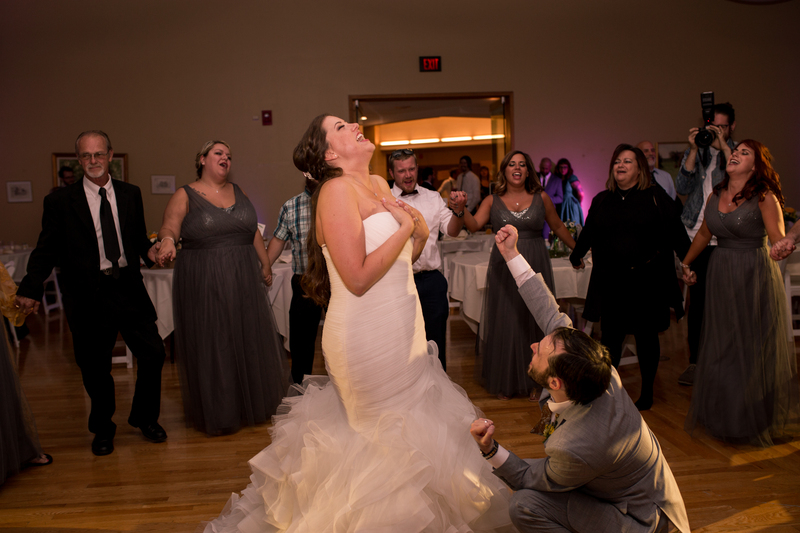 But as the night began to wind down, Sara and Aaron paid tribute to their dear friends who made the trip all the way from Omaha for their special day by playing “Don’t Stop Believing” by Journey to close out their reception. 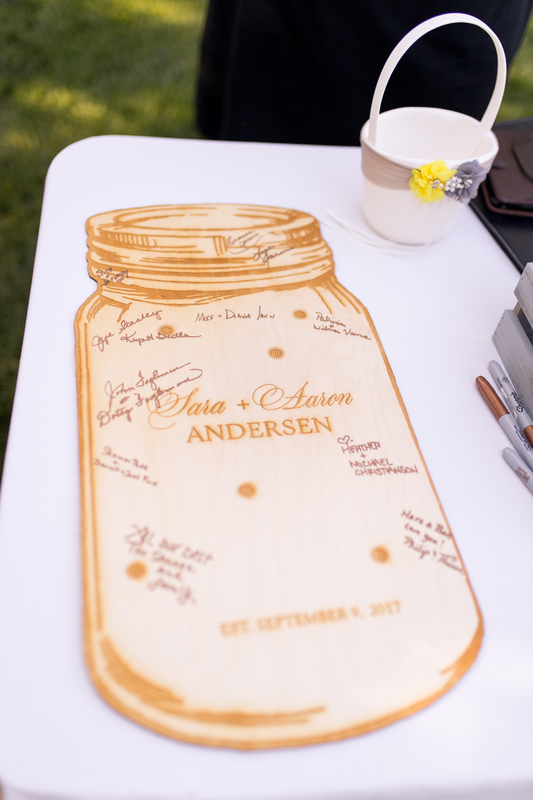 Sara and Aaron, what an honor it was to witness the beginning of the next chapter for both of you. 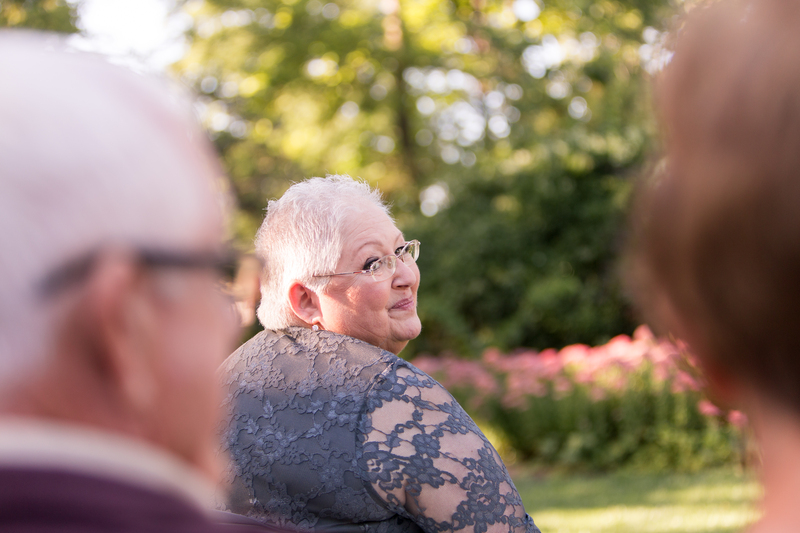 Thank you for the love and kindness from both you, your family and friends the entire day. 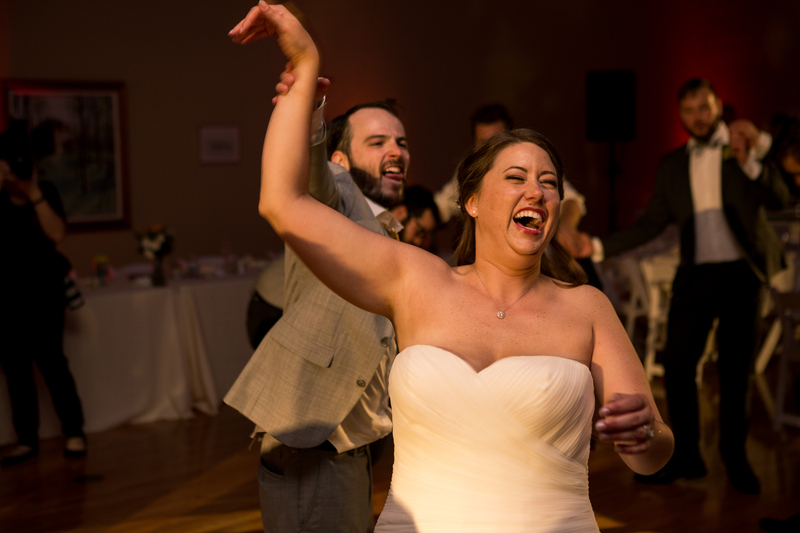 I love seeing your contagious joy when you are together, and I am delighted you chose me to document your new beginnings. 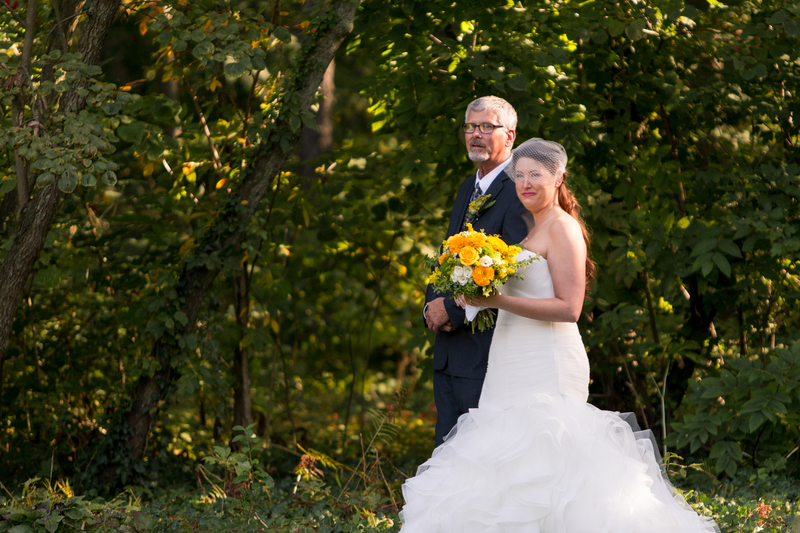 Here’s to many years of wedded bliss!